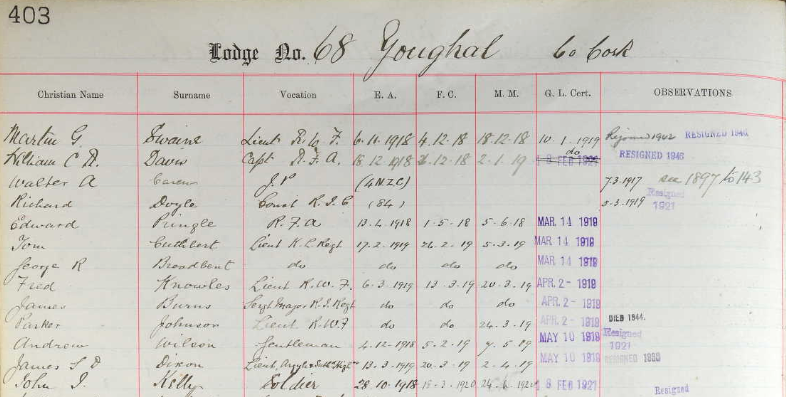 This entry was posted in Family History Searches and tagged history, School registers, Youghal on March 21, 2019 by Youghal Celebrates History. 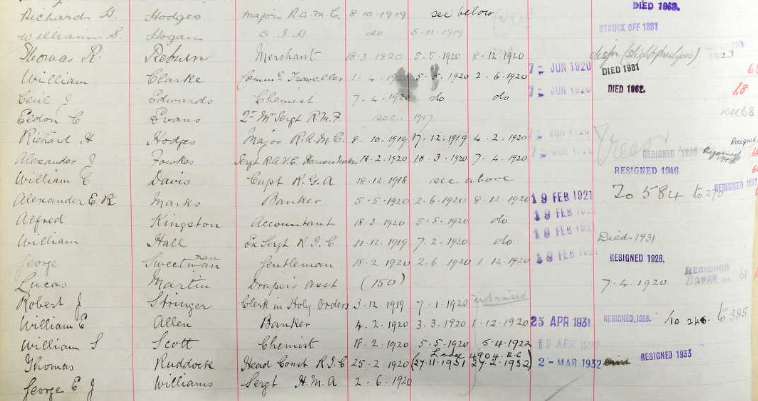 School Records can help fill in the gaps in our knowledge, especially those years before 1901. 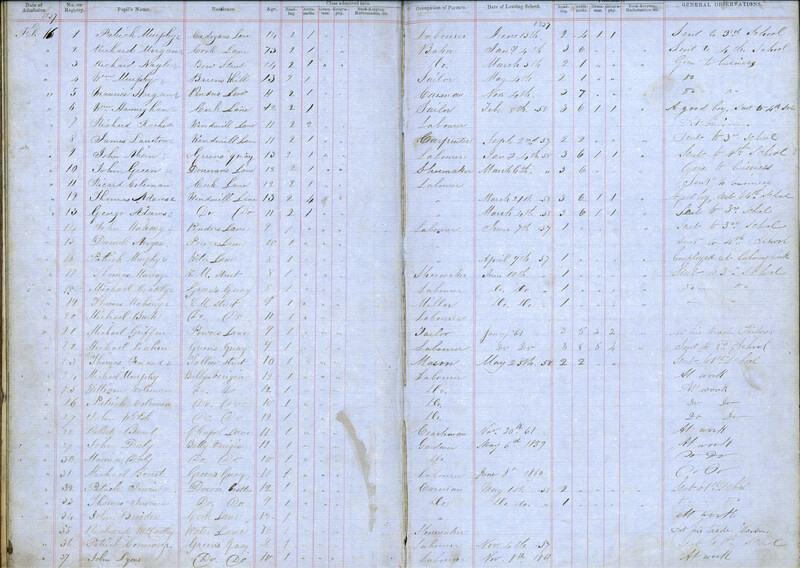 This is the Admissions Register for CBS Youghal for 1857. It lists the name of a boy, his address, his age, parental occupation and the date he left the school. You might wonder how that fits in to a genealogy search. The Griffiths Valuation is available on line, house by house for the whole country. The Youghal Valuations are dated 1851. Each house has only one occupant listed but you can match the school list with the Valuation – you now have the name of one parent. Working backward , take the age of the boy – you can now figure out his birth year and therefore know when he was baptised. This will give you the name of two parents, usually and possibly godparents. That in turn will lead you to “guesstimate” a marriage date for the couple. It may lead to information about other members of the family . You can also work forward. 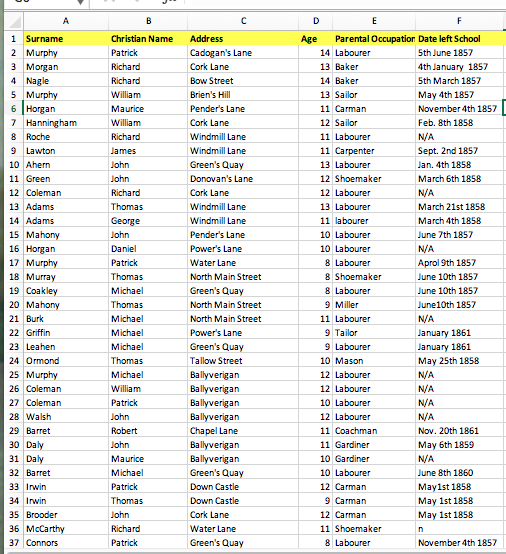 Those boys will be in their fifties or sixties in 1901 – this will help you search the census as you have a reasonably accurate age for the boy. These 1857 records come from the Christian Brothers Archives. This entry was posted in Family History Searches on August 24, 2018 by Youghal Celebrates History. I was yesterday speaking to old Timothy SMIDDY, my only surviving grand uncle, and I got from him a good deal of information concerning our family. 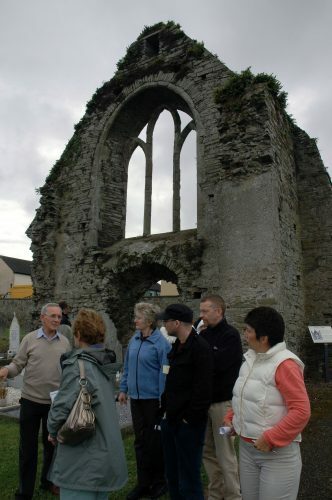 He was not able to give any particular account of the family up higher than his own great grandfather, who lived in a part of the old parish of Clonpriest called Kyle. It appears this man’s name was Pierce. 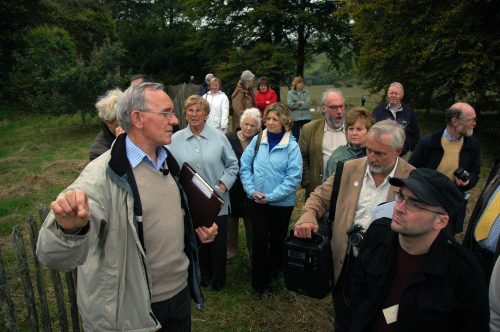 His son, that is, my father’s great Grandfather, was Richard, and lived in Ballyverigan in the parish of Youghal, where he held a very large tract of land. His son, my great grand-father, was Pierce, and he lived at Bansig in the parish of Youghal, and it was there that my Grandfather, Richard Smiddy and his three brothers and four sisters were born. 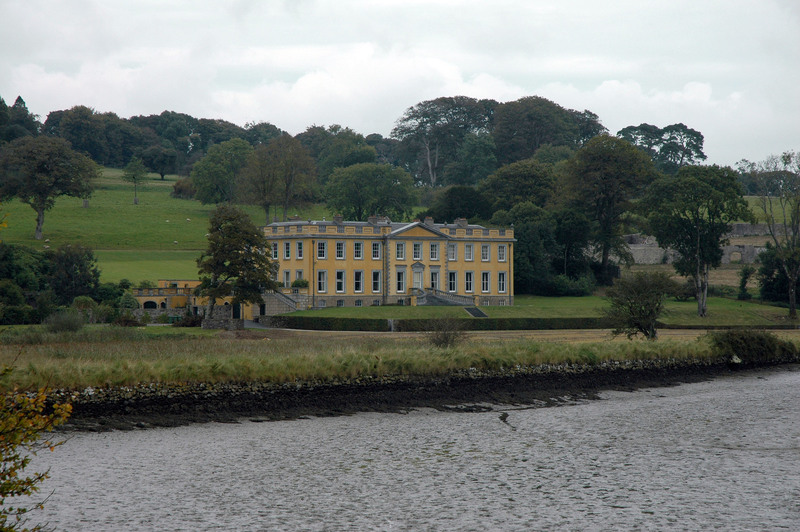 My Grandfather, Richard, got a farm at Ballyhonack, where he reared his numerous family of four sons and seven daughters, and which is now held by his grand children. My Father was the eldest of his children, and when able to go to school, was sent to his grandmothers to Bansig, near Youghal, where he remained till he was about twenty years of age. This was an advantage which he held over his father and grandfather, as the barbarous penal code had come between them and education. He was married some time after to my Mother, Honora, daughter of John Kennedy of Knockane in the parish of Killeagh. John Kennedy was a very intelligent man, fond of reading, stout and full, but a little below the middle side. He often made me, when young, presents of nice books. His Father, John, that is, my great Grandfather on the mothers side, had received no education in consequence too of the cruel penal code. Singular! The very barbarous laws which left those of my progenitors ignorant of letters, gave existence in a foreign country to a College in which an humble descendents of theirs afterwards preformed his ecclesiastical studies. Our name “Smiddy” appears to have been formed from Schmid, and to be of German extraction. In Irish they call it Schmist. My Father, at his marriage got the farm of Ballymakeigh-more, in the parish of Killeagh, and there I was born in the year 1811, about the twentieth day of the month of July. I was the eldest of nine children, eight boys and one girl, seven of whom, thank God, are now living, two of the males having died infants. Death took our Father from us when we were very young. He died of fever on the fifteenth of October, 1827, on the 18th day of his illness. I was at the time learning Greek and Latin at a school in Cloyne. I recollect well his having previously asked me whether I would wish to be a priest and as soon as he discovered my desires and disposition in that way, he determined on giving me the necessary education. I suspect he was advised and encouraged to bring me up for that state by the Rev. Robert O’ Riordan, who was then stationed in our parish, and in whom I afterwards found a sincere friend. I cannot ever forget the night my poor father breathed his last. I was at home and his death was expected for some time (a day or two before) but his danger was partly concealed from my mother and from us who were old enough to be sensible of it. It was the loud cry raised in all parts of the house and about the place, at the moment of his death that started me up from sleep – and the sensations of that moment could not be expressed! He was gone, the family young – I, the eldest of them, and I could distinctly hear my mother’s voice above the general cry, at the dreary hour of midnight, one time calling for her children, and again for “Pierse”, her deceased husband. My mother sent me to school sometime after my Father’s death, and I continued to, off and on, till 1832, when I was sent to College from an examination held that year in Mallow, by the Rt. Rev. Dr. Collins, Bishop of the Diocese. When parting from my mother at Cork, she told me to go on my knees, and placing both her hands on my head, she gave me her blessing. I left home on the 13th of October 1832, and entered the Irish College at Paris on the 20th of the same month. There Providence blessed me with a continuance of good health during the five years and a half I spent in it. I returned home a priest in February 1838, having encountered a storm and extreme bad weather on the journey both by sea and land from the French capital. Having landed in Waterford, I said last Mass the following Sunday in Youghal, that being my first Mass in Ireland. 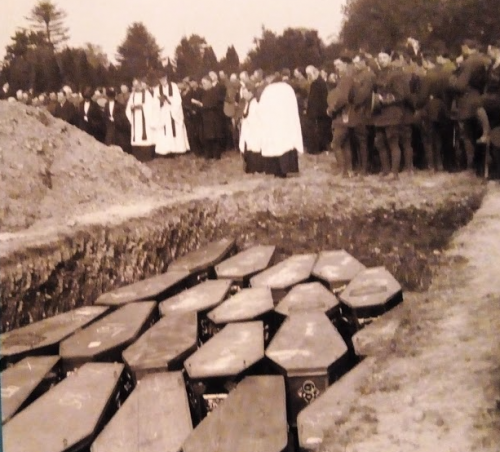 On the eleventh of the same month I was appointed second curate in Killeagh, my native parish, where I had a vast deal of duty to perform, as the cholera soon broke out there, and committed great ravage among the poor people of the village. I often paraded the street at the dreary hour of midnight and was always sure to meet with some “new case”. The state of the house at the end of Cork Road, on the west side, was truly terrific. (It has since been taken down and a new range built there). There were some half dozen families in it, of whom the most part fell victims to the disease. On the very top left of that house, which has been since tumbled down I prepared the son writhing on a wretched bed of straw in his day clothes and the father and mother dead by his side. Their name was Connell, and the poor young lad survived only a few hours. I consider it almost impossible for me to be ever again placed in a more dangerous, or at least, in a more fearful position. It was about this time that one night at Mr. Sheehan’s house at Burgess I imagined I was getting the cholera, and that I ran around the walks in the garden for an hour – a precaution which I do believe prevented its taking hold of the frame. From Killeagh I was removed to Donoughmore, where I arrived on the 9th of August of the same year, but which I left again for Glountane, near Mallow on the 18th of the following October. In Glountane there was a good deal of heavy and unpleasant duty. However, I continued to go through it and that too under discouraging circumstances, de quibus tamen silendum est. I there had an attack of illness arising from cold caught in the mountains, and it was near carrying me to the grave. However, I someway liked the retirement of the place and spent a part of many a day admiring the sublime scenery of the glens and mountains, where too we had many a noble “course” with the hounds of “Father Joe”. In reviewing that part of my life, I find something of the melancholy and still of the romantic and the agreeable mixed up with it. I often got a severe drenching of rain, to be sure, but the next day, we would have a glorious course on the mountains. On the 2nd of May 1840, I was removed to Youghal in rather a delicate state of health. I mended gradually, and thanks to the kind Providence of the Almighty I now find myself in good health and spirits. The illness of the Revd. M. Sheehan, P.P. has tended to render my situation her not so pleasant as it might be. He has not been well since I came to the parish. My chief consolation consists in being able to see my mother and family as often as I please. I intend henceforward, from time to time, for innocent amusement, as well as to induce me to reflect on my actions to keep a kind of diary, and may God grant that I may never have to enter on those pages anything that I could not in after life recur to with satisfaction and with pleasure. Richard Smiddy. On yesterday I received a letter from Wiesbaden from the Rev. M. Sheehan, who I regret has not derived much benefit to his health from his visit to that distant quarter. I intend to write an answer this day to his letter. I perceive that it is some time since I entered anything in this diary. If I continue to be so sparing of ink and paper, it would take a long time to cover the pages of this little book. Since my last entry in it some letters have passed between the protestant rector, Alsworth, and myself relative to the matter of religious controversy during Lent. I have been very severe upon him on account of his conduct towards the converts. As he has proclaimed himself a coward in his last letter of reply, by threatening the law, of course I shall have no more to do with him. He commenced the war himself, and let him blame himself for the consequences. December 24th, Christmas Eve, 1841. Thanks to the God of heaven Whose mercies the season recalls to mind, I have reached the holy time again. What pleasure, what consolation, what joy does the return of this endeared season bring to the dwellings, to the hearts, and even to the countenances of the people. In the streets outside all is preparation and busy joy. May God grant that the comfort which is derived to the Christian here from the contemplation of what has been done here to procure his Redemption, would with the necessary knowledge reach soon to the heart of the savage in the wild waste and that thus the mercies and the blessings of heaven would be felt and acknowledged in every country and by every nation and tribe from the Polar circles to the equator. I return thee thank, O my God, for bringing me safe to the beginning of this year and for the merciful Providence with which Thou hast watched over me. If it be Thy Will that this year too should be added to the period of my mortal existence, vouchsafe to save me from danger, and give me grace to spend it well. Amen. Many changes have taken place here since the beginning of the year. All my fellow curates have been removed, and I am come to live to the Presbytery in Strand Street, which place I will call “South Abbey”. I have, thank God, enjoyed good health and have been in a great measure relieved from singular parochial annoyance. No grievous scandal has to be reprimanded as in the case of the unfortunate “monk”, and there was no fighting with rectors or preachers, except the cool and peaceful lecturing on controversial points in the church during Lent. I have been much comforted and encouraged by the improved health of the Parish Priest. We have had this year a General Jubilee on behalf of the afflicted Church of Spain, of which many heretofore stubborn person profited, and which kept us engaged in the Confessionals for several weeks of the summer. Blessed be the Lord for all His gifts and graces. The season is now plentiful and the people content after having enjoyed a most propitious summer. The weather is exceedingly soft and mild. The sacred ceremonies and service of this day were long and passed off well. I have said three Masses in three different places, attended at High Mass performed by the Rev. M. Sheehan, and heard the last Mass too, at which there was a Benediction of the Most Holy Sacrament. What a cheering and edifying sight did the church in this town present at first Mass today? When the sermon and service were finished, no less than eight hundred persons men, women and the youth of both sexes received Holy Communion. No words can describe the ardent devotion and holy joy with which they rushed up to the steps around the altar to receive “the Bread of Life”. Parvuli petierunt panem. Through the Confessional duty for the two days previous was extremely heavy and fatiguing, still the happy fruits repaid all. Thanks to the merciful Providence of God, I have reached the beginning of this year. The past, indeed had its share of difficulty and labour, but by the assistance of the Almighty, I have been able to go through it with health unimpaired. Now several matters occur to the mind which marked some parts of the old year, through perhaps they were passed unnoticed when they occurred. As we must render an account for every idle word, it naturally strikes one that there is much to be answered for in the thoughts, the words, the actions, and the omissions of the whole year. May God in His mercy forgive me whatever guilt may have arisen from anything in this way, and may He confer on us the grace by which we may spend the present year according to His holy Will, in the strict fulfilment of every moral and ministerial duty. Amen. The early portion of the year has passed off well, and during the Lent which has just terminated, the labours of the mission here were more than ordinarily severe, though, thank Heaven, they have left no dangerous effects on my health. The usual course of lectures was kept up in the church and the Good Friday sermon was preached by the Rev. Mr. Keane of Midleton. There has been much said and written about certain females who were thought to be the subjects of miraculous appearances at the Rev. Mr. Foley’s castle. From the commencement I suspected that something wrong was going on, and now, after the investigation instituted by order of the Bishop, there remains in my mind no doubt as to its being a most wicked imposition, got up by some villains in that place for some purpose or other of their own. It was perhaps, unfortunate that the thing was not exposed sooner, and suppressed, but it was not in our power to do so, as from the moment we manifested incredulity, we were not allowed an opportunity of examining the matter to our satisfaction, and could not, of course, therefore, denounce the proceedings. The parsons, who could not let such an opportunity pass, published a “Protest” against the “miracle”, and, as usual they took occasion to calumniate the Catholic Religion in general. I wrote rather a lengthy reply, signed “A Roman Catholic” declaiming of course all connection with the proceedings, and commenting severely on the Parsons and their Document. The streets and general appearance of the town of Youghal are much improved by the flagging etc., but there is a great dullness in business, and almost all the trades are complaining of want of employment. In the neighbourhood, too, there has been raging for some time a disease among cattle (cows) by which some of the farmers have sustained considerable loss. Under the influence of a Tory ministry, with no measure even mooted in Parliament that would be beneficial to Ireland, and the low price for commodities of all kinds, the times indeed look gloomy. The repeal agitation is spreading, in truth, it alone can procure a remedy for the evils of this afflicted, wronged country. It is now nearly two years since I was enrolled a member of the “Legal National Repeal Association”. I hope I may live to see the day when my country may be under the fostering care of a domestic Parliament. Since my last entry in this book a vast deal of parochial business has been got over by us. The Bishop has made the Visitation of this part of his Diocese, and in this parish he administered the Sacrament of Confirmation to vast numbers, young and old. The following is the notice which sent of it to the “Tablet”:- “Right Rev. Dr. Crotty. This prelate has commenced the annual visitation of his extensive diocese. 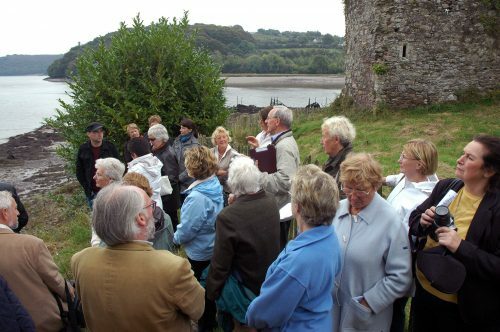 The first parish visited by him was Youghal, where on the 17th and 18th instant (June) he administered the Sacrament of Confirmation to one thousand four hundred persons, young and old, of both sexes, all well instructed in the principles of Religion, and of whom a large number were converts”. Preparing these and hearing their confessions added much to the labours and ordinary duties of the season. At the Visitation all was satisfactory and agreeable – no omission of duty on the part of the clergy, and no complaints against the people, with the exception of those vices prevalent in large towns, and the infatuation of some Catholics who had joined freemason societies. The day before yesterday I visited Ardmore, and was much pleased with visiting its remains of antiquity. The tower is a superior one and in fine preservation. There is a little shake in the summit, caused, it would appear, by the effects of lightening. 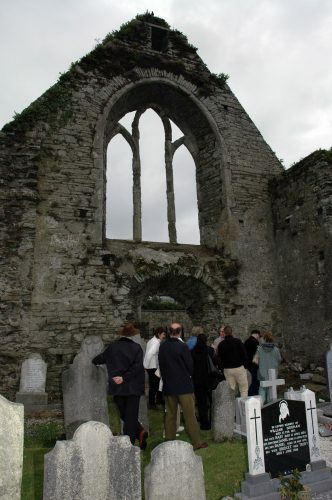 The remains of the old churches are kept in good preservation, and the one by the seaside appears, from the manner in which the stones are laid and the peculiarity of the masonwork to be very ancient. The large round stone on the seashore about which there are such singular traditions among the people, presents a very peculiar appearance. It seems, if not formed by, at least to have passed through the action of fire. Perhaps it is an aerolyte which fell to this earth, at some time about the period that St. Deglan preached the Gospel of Christ at Ardmore. Its sudden appearance in that way might give rise to the tradition which says that it travelled from a distant country on the surface of the waves, having attached to it the bell which St. Deglan had forgotten and which was to be used at the celebration of the sacred mysteries. I would be still more firm in this supposition only that on examination I found the stone to bear certainly some resemblance to the rocks of which the adjacent hill is composed. We have had a most charming summer of it, favourable to the crops and particularly that most useful root, the potato, on which depend the poor for subsistence. Some matters occurred at the infirmary with respect to a convert which induced me to publish the proceedings of a Committee meeting by which the conduct of Parson Alsworth and others was thoroughly exposed. I believe it would be difficult to find a more glaring case of bigotry in the annals of the nineteenth century. 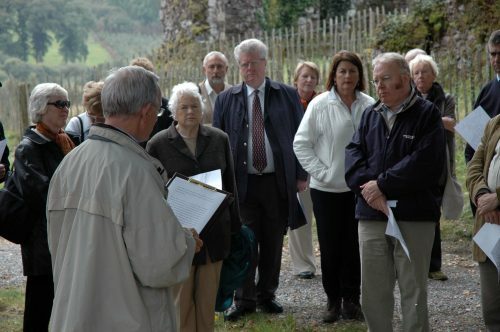 They appealed to the Lord Lieutenant to see if the Orange spirit of the Castle would come to their support, but the proceedings tended only to turn them into complete ridicule, as I and the other Catholic members of the Committee lodged a Protest against their memorial. It turned out to be an admirable case. Our Stations are to commence to-morrow and we are about to enter on the heavy labours of another year. The summer vacation was indeed long and the season dry and pleasant, but circumstances obliged me to stay at home more than perhaps was agreeable or useful to health. Nothing tends so much to free the mind and give vigour and elasticity to the system as an excursion to some distant quarter. It alone relieves the machinery of corporal exertion, and quiets the mind, too, by removing for the time all care and responsibility. 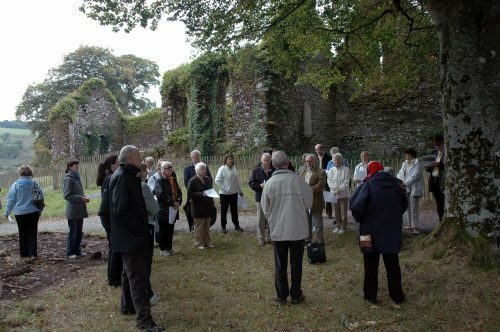 I have attended the Repeal meeting held lately at Lismore and was proud to head the “Trades of Youghal” there, for indeed, they made a most respectable appearance. I had never before a better opportunity of witnessing their spirit, their intelligence and their confidence and pride when thus under the guidance of their clergy. With all the favourable circumstances which attended that “Monster Meeting”, the immense multitudes collected there from distant parts of the three counties, the number and variety of the banners, the loveliness of the day and the beauty of the scenery, and above all, the order, the temperance, and the mild but form determination of the congregated masses – their approach to the platform, to hear the accents of freedom from that great man, was certainly the most splendid sight I ever beheld. I was present at the erecting of the Obelisk on the Place Louis XV at Paris, where persons were collected from every country in Europe, with the scene too enlivened by the presence of the royal family, but whether it was that I felt more interested on the occasion my eye was certainly infinitely more delighted with the appearance of the Masses who crowded round the Liberator at Lismore. The present is a most important, even appalling crisis. The government, at the head of which in this country is Earl de Grey, have Proclamation, suppressed the Monster Meeting which was to be held at Clontarf on Sunday the eighth inst. The Liberator with his son John has been obliged to enter bail for his appearance at the next term to be tried on a charge of “conspiracy and other misdemeanours!” The excitement occasioned by these proceedings is fearful indeed nor can anyone now calculate to what disastrous results it may lead. In the event of a conviction and imprisonment, to keep the people quiet or maintain public order would appear to be beyond the range of possibility. A dreadful catastrophe seems to be near at hand – the destinies of this country are vibrating in the balance! In Deo tamen est spes nostra. Since my last entry the public mind has been kept in suspense as to the probable result of the “Monster” State trials in Dublin. It is, probably, that agitation which has kept me from noting any occurrences in these pages up to the present period. The commencement of the new year was past by without a reflection, in fact all was absorbed in an anxiety about those mighty events on which was thought to depend the tranquillity of the country. The Crown officials procured a “packed Jury” and from them they have obtained a verdict of “guilty” against O’Connell and other traversers. A verdict thus procured has no other effect than to exasperate still more the lovers of a domestic legislature and bring many others into the Repeal agitation. Judgment has not yet been passed on the Liberator. He is at this moment in Parliament to assist in exposing the Tory Government with respect to the state of Ireland on a motion now before the House by Lord John Russell. It is hoped that some good may, after all, spring from this anomalous state of things. That God may be pleased to avert further calamities from Ireland, and look with mercy down upon a long oppressed people is the ardent and humble prayer of the writer of this short and imperfect notice of the events of a nation struggling for freedom. The season of Lent is now half spent, and as we have not engaged in any controversial lectures the duties are comparatively light. Our silence on those topics is owing to the unusually peaceable demeanour of the parsons who have neither put up placards nor made any other move about the “errors of Romanism”. There is, at the present, manifesting itself in England a favourable spirit towards Ireland; the late proceedings in Queens Bench are denounced in every quarter and O’Connell the “convicted Conspirator” has been most enthusiastically received and complimented by the people of London, Birmingham, Manchester, etc. etc. The prospects of the Protestant Church Establishment in Ireland look blue, nor should I be surprised if the country found itself relieved of that incubus before the lapse of two or at most three years. Welcome any happy change that would tend to destroy fell party animosity, and induce all classes and creeds to unite in advancing the true interests of universal Ireland. I could not well express the feelings with which I have read on the Tablet Newspaper of last Saturday a notice of a work entitled “Wanderings in Spain in 1843 by Martin Haverty Esq.” The name of this man, one of my class-fellows in the Irish College, Paris, and the recollection of his undeserved treatment there have awakened in my mind a sort of melancholy feeling, mixed, however, with no small joy on finding that he has published a book that does so much credit to his head and to his heart and to what I always considered his inextinguishable deep religious impressions. Poor Haverty! You have written of the persecuted friar in Spain once the missionary of the distant islands, in the manner that I would expect from a man of your honest heart. Your exclamation “Poor Man!” came from your innermost soul and I can well imagine the tone of your voice when expressing those words. Yes, and the heavy sigh of your heart when such an object came under your eye. Honest Haverty! You are not like many who have fallen when a student you loved, and which I am sure you still venerate; nor have you lost your respect for the ministry to which you aspired – let me say belong – but from which you have been turned aside by the precipitate conduct of a superior. The writer in the Tablet knows no more of him than that he appears to be a ‘sound Catholic’. He is in Sub-deacon’s orders, and he had to leave the Irish College for honest independence displayed, too, not in a matter concerning himself personally, but in a proceeding which affected the whole body of the students. On his departure from the college the students made him a present of a box containing twenty-two sovereigns, as a mark of their esteem and gratitude. It was I who deputed by them to present him with the box and for my doing so, I was not called to Orders at the next Quarter Tense! Perhaps I deserved the censure, but if similar circumstances occurred again, I would act in just the same way. I shall procure those “wanderings” as soon as possible; they will be pleasing reminiscence of a friend whom I have met but once, and then only for a short time, since he left the Irish College in 1836. I have been present at the great provincial dinner given to O’Connell in Cork on last Monday. It was on the whole a grand thing. Who could, a few years ago have imagined that a meeting of such men would take place and be held in the Mansion House the boast and pride of Tory monopoly? When the members of the different corporations were passing down the large staircase followed by the Catholic priests, I almost imagined that the statue of William Pitt which occupies a niche there was actually shedding tears. O’Connell appeared in excellent spirits, but it was evident that age is throwing its shrivelled mantle around him. A gloomy cloud has passed over the face of Ireland, but now it is bright and joyful sunshine again. The man of the people, O’Connell, was hurried with blind indecent haste to the gloomy cells of a dungeon. Ireland during the three months of his and his fellow-sufferers unjust imprisonment stood calm but surly and determined. Now, however, by the reversal of the sentence her mourning is passed away, her leaders stand free and unshackled by the insolent conditions which a prejudiced judge sought to impose, and the officials of the Government with their monstrous proceedings are disgraced for ever. Heaven heard the prayer which only a few weeks ago ascended from the altars of a faithful, though long persecuted people in behalf of their leaders. The past summer was indeed delightful; the harvest was early and it is thought the produce pretty fair. No particular change has occurred with regard to myself. The duties of the parish present the same monotonous aspect and require our attendance so continually that I could not afford myself, even at this season, so much as one week’s leisure. 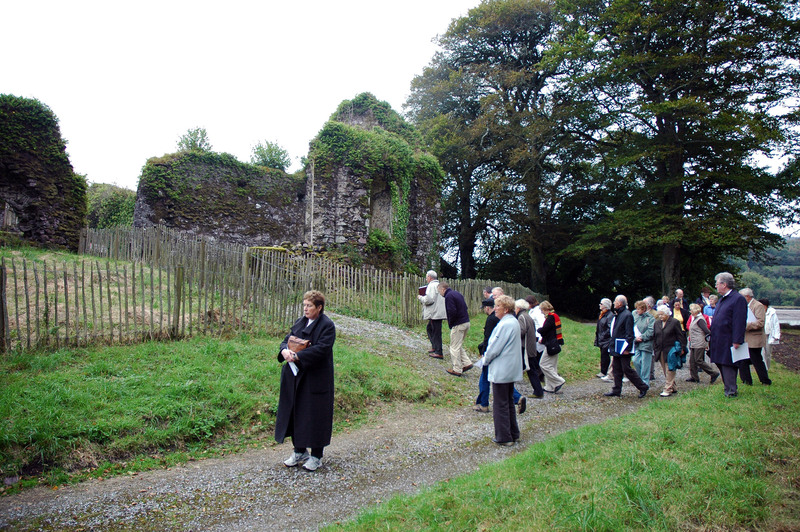 We have had a spiritual Retreat in Cork this year, conducted by Dr. Hely, a Jesuit. It was truly an edifying and, it is to be hoped, a useful week. After so many years on the Mission, I had need indeed of such an opportunity of self-examination, and I pray heaven that the rules there suggested and the resolutions formed may exercise a wholesome and happy influence on my future life. In the month of June last, was a general meeting of the subscribers to the Youghal Infirmary, Dispensary and Fever Hospital. Matter which had been made the subject of publication in the earlier part of the year respecting the rights of conscience, and which brought me and others into collision with the majority of the “Committee” were brought under the consideration of the meeting. In despite of the opposition of the “Rector” Aldworth, and the mad bigots who supported him, the rights of conscience were acknowledged, and I succeeded in passing the following resolution, which conveyed a marked censure on the last Committee, with whom I had been battling on the Press and at the monthly meetings for a great part of the year. “Resolved. That we recognise and shall secure to all patients in those Institutions the sacred right of liberty of conscience and the great privilege of being attended by clergymen of their own choice, and that the committee do take care that this right shall not be infringed on either by omitting to send for the desired clergyman, by opposing any obstacle to his visiting the patient, or by allowing any other person to obtrude any peculiar views of religion on the patient contrary to his or her declared conviction”. As I had engaged the attendance of a reporter from the “Cork Examiner”, the proceedings were published, and the “Rector” had his share of very unenviable notoriety. The New Year has opened upon me and calls to mind all that I owe to a merciful Providence. The past year might have had its troubles and its labours, but thanks to my God, I had nothing to suffer from sickness or ill-health. That Providence which spared and saved up to the present period may still continue to watch over us! and that the Divine Grace may inspire and enable me to spend the coming time in a manner agreeable to the will of God. Passing incidents for some time have been scarce worth noticing. 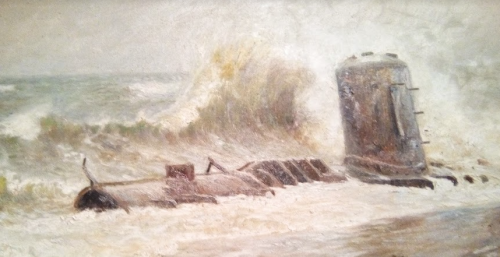 The only remarkable thing was a severe storm in which, among many other accidents, two vessels were thrown ashore within a few yards of each other at the base of Clay Castle, where one of them now lies, a heap of broken sticks, while the other is being repaired in the hope that it can be put to sea again. The Catholic church of this town has been lit with gas and presents on those evenings of Lent a very brilliant appearance. The Lent being now over, it may be said that the most onerous duties of the year are also terminated. Nothing worth noticing has occurred since my last entry, unless, for want of more interesting matter, it might be recollected that we have had some severe weather, frost and snow, and that this has been in other countries a very cold season. Religious animosity seems to be abating in this town, at least, we have witness or heard of only a very trifling share of the usual Lent ebullitions of bigotry, and uncharitableness with the blessing of God, will mend in this hitherto, and even still unhappy country. The Government appears to be disposed to be somewhat liberal towards Ireland, and for the sake and security of the Empire such should be their active and persevering policy. Foreign war threatens; America is grasping lands, which hitherto were not a part of the States, and France is evidently only waiting for an occasion. With Ireland alienated, England would be in peril. These indeed, are in themselves, temporal matters, but they may exercise an influence on Catholic Ireland, and through advance the cause of religious truth all over the world. I have just returned home after having made a small tour through the country. 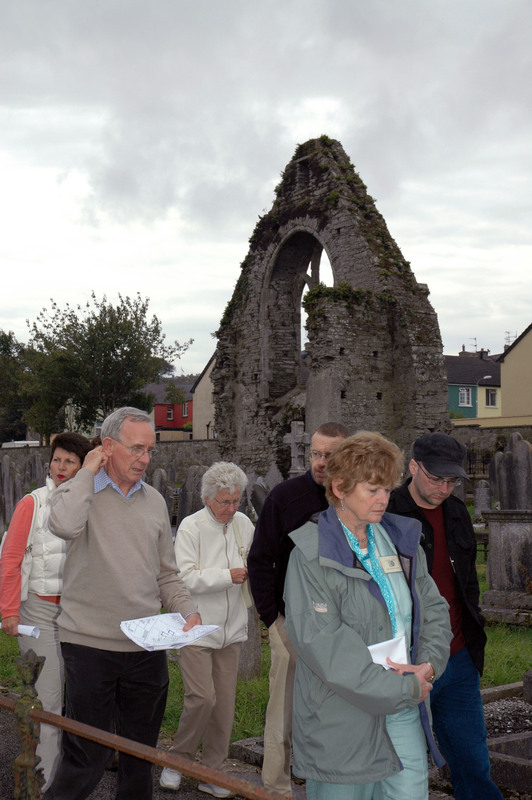 The place visited by me was the neighbourhood of Mitchelstown. I left home for the purpose of attending the Month’s Mind for poor Father O’Connell of that town, and as I found myself abroad at all, I determined on making the most of my opportunity, and of my time. I visited the Galty mountains, the highest peak of which I reached after a toilsome journey up its steep and rugged sides. The view from the ground over the lake was splendid: we saw a great distance into the heart of county Tipperary. When on the summit of the mountain the view was not so good, owing to the mist which came on and vanished at intervals and which rendered the place, too, extremely cold. But as the cloud passed over the plain country below, the effect on the eye was grand. There was sunshine and shade sweeping, as far as vision could reach, over mountain, river, grove, rugged valley and cultivated plane. We wanted not an appetite for the good things which we had brought with us. The ‘Mountain Lodge’ is in itself a nice thing, and looks beautiful in the midst of such scenery. On the following day we visited Kingston’s Castle. It is a princely building, though, as it struck me, not able to make its master happy. The gardens and greenhouses were fine, but the place had a deserted appearance. I derived both health and pleasure from the week’s excursion. I visited St. Finaught’s well near the town and drank some of the water. How frail and fleeting are all earthly things! 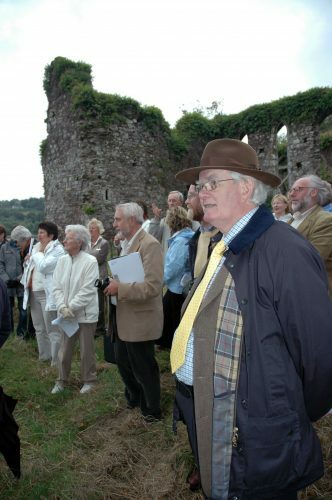 I have this moment heard of the death of poor Mr. Lamphire, one of the small party who with me visited the Galties. He was a Protestant, lively and intelligent in his conversations. What could have been our feelings, if, when taking our repast on the summit of that hill and passing round the goblet and the joke, we were told that a member of our little party was to be in eternity at the end of two months? And such is life! I have just returned from Cove where I saw the Synachron and was on board some of the warships. What a curious little world each of them is in itself, and how melancholy to think that it is necessary to maintain such destructive engines in which, too, man is both morally and physically degraded! I was in one of the war steamers propelled the Archimedean screw, and as they were just unshipping the propeller had an opportunity of seeing the manner in which that new invention is constructed. In the “Queen” I was spoken to by a Youghal boy who was one of the hands and whom I immediately recognised. The Australian Gazette has brought the melancholy intelligence of the death of an old neighbour and schoolfellow, the Rev. Edmond Mahony. He was a native of Killeagh and left home for the mission of Sidney in January 1838, the very time I returned from France. Among other friends he was at my mother’s house the evening I arrived there after a very dangerous voyage from England, and as he left early the next morning for Maynooth to be ordained, I have not had the pleasure of meeting or seeing him since. Poor man! he was a loss to religion one in that remote region. These sad warnings remind one that the world is growing old around him, and that we are growing old with it. Since the last entry was made in these pages a long period has elapsed – winter has passed away, also Spring, and even the greater part of summer. It would appear that the more we grow old, the more careless we become with regard to the incidents of life. Other reasons, however, may be quoted for this omission of mine. Some little literary trifles have filled up my vacant moments for the last few months, and withdrawn my attention from the “diary”. The gloom of winter, the beauty of spring and the splendour of summer were felt as on any previous year, the song of the cuckoo, too, was not unheeded, nor was each season without its peculiar pleasures and its toils. Another matter too, has conduced to withdraw one’s notice from passing events, which is the general distress of the country, owing to the mysterious failure of the potato crop. Active exertions have been made to relieve the destitution of this town, and by them additional duties have fallen to our share. I was one of the deputation to Dublin to solicit assistance from the Lord Lieutenant and to make application at the different Boards for some works that would give employment. It is probably owing to this necessity that the Courthouse is to be so speedily built here, and that a light is to be established on Capel Island. We have much trouble with these matters that occupy the Committee for the employment and relief of the poor, but it is a work of charity, the most imperative and indispensable. We have made successful efforts for the taking in of the slob ground to the north of the town. On every side is heard the voice of want and woe. The poor people are gradually perishing by starvation. The potato-failure, which was only partial last year, has been general this season, and direful distress is the consequence. A short time ago there was much rioting and disturbance in Youghal which however passed off without the loss of life. It entailed upon us clergymen much labour and trouble in striving to allay the ferment, and provide food and employment for the suffering poor. We had — poor comfort! the thanks of the Lord Lieutenant Besborough, for our “great and successful exertions in allaying the excitement of the populace during the late disturbance at Youghal”. There are at present some public works going on to employ the people, but owing to the low wages and the high rate of provisions, this affords but very inadequate relief. God alone knows how we are to get over the year, if we can expect that the distress will terminate even then. Who could have imagined that the potato could effect such a revolution. The whole population are thrown upon corn food, and pigs, dogs and poultry are disappearing from the country. Thanks again to the Lord for bringing me safe to the beginning of the New Year. The present season has not, as upon other occasions of the Kind, introduced joy and comfort to the homes of the people. The gloom of destitution and of want hangs over the land, and penetrates even the heart of those who are beyond the influence of hunger themselves. May God restore to us soon a better state of things, and avert from the country for evermore so melancholy a Christmas. With a heavy heart I take up the Diary to-day to record in its pages the death of my poor brother Lawrence. I witnessed his last struggle on last Tuesday, 19th inst. at about 2 o’clock afternoon, being at his bed’s side, and having spoken to him and shaken hands with him a few minutes before he expired. To the last moment he retained his faculties, and seemed even, for some hours previously to have possessed more than ordinary wisdom and clearness of intellect. His sickness was a decline, brought on, nobody knows how, unless it was by excess of exercise, for he was active and spirited. He was preparing for the ecclesiastical state and was ready to enter College, being in his twenty-first year. Yesterday I accompanied him to the grave at Killeagh. It was a sad trial to me, after all the trouble which, even personally, I had taken with his education for the six or seven years that I had him living with myself. His death, indeed, reads me a telling lesson on the frailty of human existence. Requiescat in pace. As a pleasing, yet sad memento of him, I here preserve his signature to a letter written to me by him when at school in Cork, May 10th, 1846, informing me of his delicate state of health. On the death of a beloved brother. Too bright it fades away. To moulder by thy side. How many tears I’ve shed! Weep for the early dead. We’ll meet with smiles in Heaven. We had this day a solemn High Mass and office, in the Youghal Church, for the repose of the soul of O’Connell, the Liberator of his Catholic fellow-countrymen the clever lawyer, the ardent patriot, the firm Christian, the noble orator and writer, the consistent and successful advocate of civil and religious liberty, all over the globe. A light has truly left this earth, and poor Ireland has lost her staff of support — lost him too in the midst of her troubles, too aggravate still more the distress and suffering of her people. I know not almost how this season has passed over my head. The general calamity has overwhelmed every comfortable feeling, so that incidents which at other times would be recorded with joy have been allowed to pass by altogether unobserved. Even the song of the cuckoo itself, though heard as on other years, was almost scarce heeded. There is however, now a ray of hope appearing – the crops look beautiful and promise a speedy and plentiful harvest. The harvest is now gathered in through the country. The corn has been most abundant, but the staple food of the people, the potato, is utterly insufficient, and distress already begins to be felt. The coming winter even, it is to be feared, will be perhaps more terrible than the last. The country has sustained an irreparable loss in the death of the great O’Connell. On his journey to Rome where he intended to pass the winter to restore his health, he expired at Genoa after having received a public expression of the respect of the people of Paris and the other cities through which he had travelled. Our poor country has been deprived of the services of her greatest man and that too in her day of deepest distress. Many other most valuable members of society have been this year swept away by fever and other diseases generated in the land by the destitution of the people. We have indeed been receiving assistance – generous and noble from America and other countries, but it is most melancholy to think that and Island of such fertility, and of such vast natural resources should be thus a burden to the nations that surround it. Misgovernment and misrule are the agents of our misery. No notice, I perceive has been taken by me here of the commencement of the new year. Christmas passed away, and the other Holidays, without a reflection or comment. Distress still hovers over the land, threatening to rival, if not exceed that of last year, and it has had the effect of so engrossing the thoughts of the mind as to exclude even the little relaxation derived from noting the passing events of the season on these pages. Sad indeed is the condition of our country at this moment. The hum of industry has died away in the fields, and the people who ought to be employed there are gone to the grave, or are pining away wholesale in those cornstores and other wretched houses that have been fitted up for their reception under the late Poor Law. 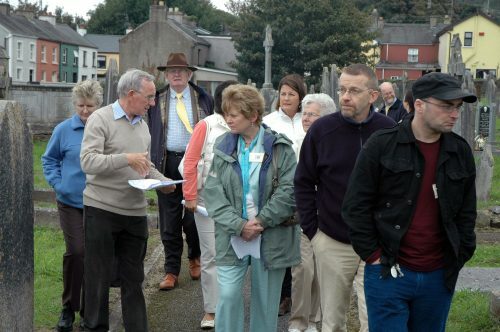 In this town of Youghal, an old corn store situated in the most dense part of the town has been taken for this purpose, and one thousand human beings, made to the image of God, are crammed into it at this moment. As a matter of course the priests have to go there often in the day to attend the dying. God relieve our poor people and country and release us all soon from this wretched state of things! Amen. A terrible tempest has been lately raised against the Irish priests with respect to their conduct in this crisis. They have been charged with “denouncing” exterminating landlords and others from the altar, in order that they would be murdered. The charge is now proved to be false. I have addressed a public letter on this subject to the premier, Lord John Russell. It is truly cheering to notice the fine spirit manifested by the French towards this country on the late occasion for the obsequies of O’Connell in Paris. Father Lacordaire pronounced the eulogy – a splendid oration. It is manifest that a fine spirit, favourable to religion, and true liberty, is growing up among the French. God Prosper it. A Revolution has taken place in France since the above remarks were entered, and by it Louis Philippe and his family have been compelled to fly from the country. A Republic has been established. I will just now write out the Marsellaise song at the end of this book, and when leisure allows it, I shall attempt an Irish translation. I believe the Irish language is very capable of sustaining the rhyme and the sentiment. I may as well write it out here, if it was only for the variety of the thing. Qu’un sang impure abreuve vos sillons! Feraint la loi dans nos foyers! Quand nos aines n.y serout plus. Portez, ou retinez cous coups. The verses 1, 2, 4, seven and eight, as arranged above are those which are usually sung at present in Paris. Allmhuraigh, is iad ag armail. Is meirligh ar droch ruithigh! Is meirlig ar droch ruithigh! Ceard e meon seo, na sluaite daor? Treatanaigh is namhaid ar ndaoine? Preabaigi bhur sciath, a chlanna na nGael! Do thug sinn bheith cor-urra d’ar saoil. Le marbhu, no crochadh, fuil aon. Nil braon a thitigh na fiach dioltais. Teithigh tiranaigh as ar nduiche. Ta a gcaisleain is a dtailte le roinnt. Ma thuiteann roinnt daoine ar lar. A mbuaidh comh ceart d’ard is d’iseal. A ghradh naomhtha ar dtire! Chun tiranaigh a chur le fan. 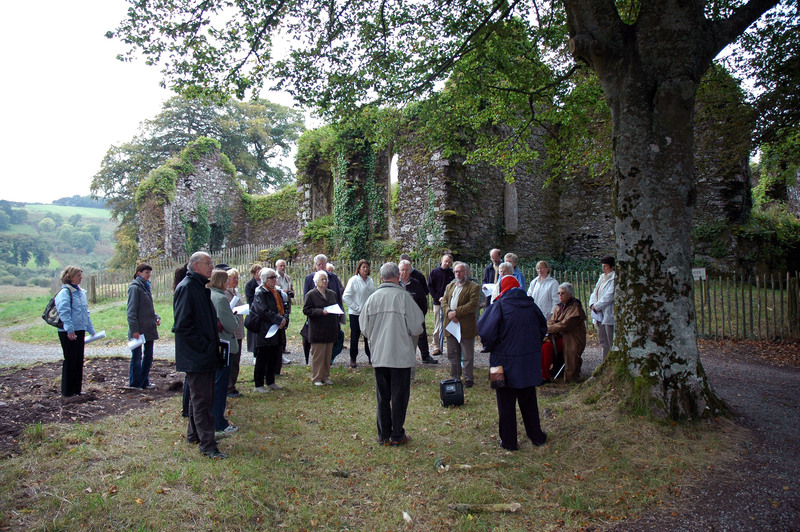 Fe choir, fe chothrom, is dlighe ceart. Well, I have succeeded in producing a translation, good or bad as it may be, of the Marseillaise into Irish, and in this shape it has been published in the Southern Reporter Newspaper of the 8th of April last. The weather is very fine at present, and on this day, I have for the first time this season heard the notes of the cuckoo at Ballymakeemore. The gloom of distress still hangs over the country: but the ardour with which the people have been planting the potato this year shows that, after all, they do not despair. God grant that their expectations will not be disappointed. I spent last week at the Retreat in Cork which was there held at the Presentation Monastery, and at which the clergymen of the country attended. The parish priests came on the first week, the curates on the second. This was the third retreat which I have spent there since I came on the Mission, the first being in 1838, and was conducted by Fr. Kenny, S.J., cuius animo Deus misereatur. The second was conducted by Fr. Hely and the third by Father Lynch, whose lectures displayed more of piety and earnestness, than of eloquence. Fr. Kenny was a most eloquent preacher. This year again the potato disease is appearing in the country, absolutely subjecting the people to gloomy apprehensions for the future. Many of our people too, are being prosecuted by Government or are lying in jail for political offences, or as they term it, for exciting a rebellion against the Queen. Where all these misfortunes will end, no man can foresee. As yet no person has been arrested in Youghal on this account, and for the sake of peace and good feeling, I hope none will. I have committed a short sketch on “St. 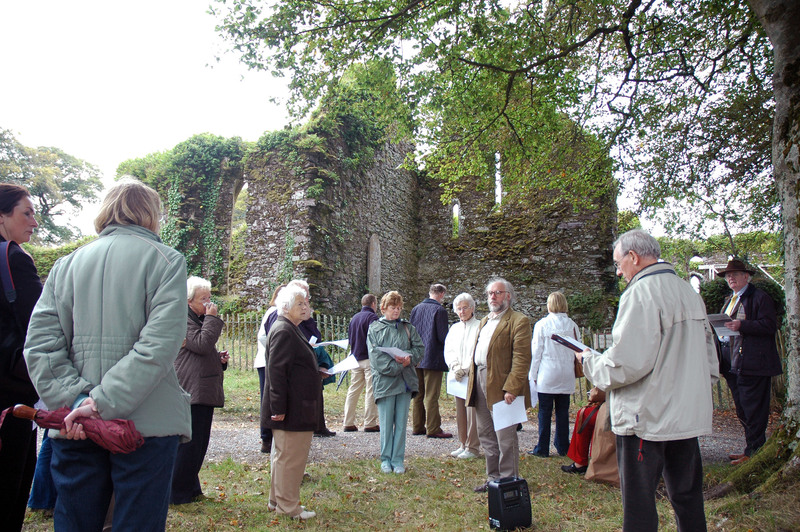 Anne’s Chapel, Youghal”, which is published in the Southern Reporter of this day’s date. And here just for the curiosity of the thing, let me recount the principal literary trifles published by me up to the present moment. Well, then, in 1839 I published a letter in the Southern Reporter signed “A Catholic Priest” on a libel case on a Catholic clergyman by a Protestant minister in Limerick. In 1841 I had a difference on religious matters with Mr. Aldworth, Rector of Youghal, and two letters were written to him by me with my proper signature. In 1843 there was a case of attempted proselytism at Youghal Infirmary that was countenanced by the officers of that institution, and a majority of the Committee. I published a long report of the proceedings together with a letter to “Samuel Allen, chairman” on the subject bearing my proper signature. In 1844 I wrote some letters to the Cork Examiner against Mesmerism bearing the signature of “La Verite”. They were provoked by the extravagant doctrines of an itinerant lecturer, and his defence by many of the protestants of Youghal. In 1843 I wrote a pretty long letter signed a “Roman Catholic” to the Rectors and Protestant ministers in and near Youghal on the subject of a Protest published by them about miracles. In 1844 or 5 I wrote a letter signed C. Priest published in the Cork Examiner on the rule for finding Easter and showing that in the Protestant Book of Common Prayer the rule given is incorrect. In 1847 I wrote a “Tale of the Penal Times” published in Duffy’s Catholic Magazine of that year. In 1848 I wrote a letter to Lord John Russell on the “Calumnies on the Catholic clergy” bearing my proper signature. In 1848 I wrote and published in the Cork Reporter an Irish translation of the Marseillaise Hymn signed “Clericus”. Several other articles and sketches were written by me in different papers, which bore no signature. Whether what I have on the anvil at present will ever be exhibited to the eye of the public time alone will reveal. In this part of the world where there is nothing meriting the name of a library, I find it very difficult to come at some books for reference that I want to keep up the heart. The potato crop is severely impaired this year again. It is feared that we are on the eve of another famine. God help us! The new year has opened upon us without however bringing hope of coming prosperity to the country. In Youghal there are now two auxiliary poorhouses filled to almost suffocation. There the once powerful arm of the peasant is wasting away in idleness, while the soil which he ought to be cultivating is returning to its original wildness. I have just returned from Clonakilty where I have attended the funeral of our deceased Bishop, Doctor Walsh. There was a large number of priests present, about 70, I think. He was a man of good reputation and much liked by his clergymen. As a memorial of him I attach to the next page his signature to a dispensation forwarded to me a very short time ago for parties in this parish. The Month’s Mind for the Rev. 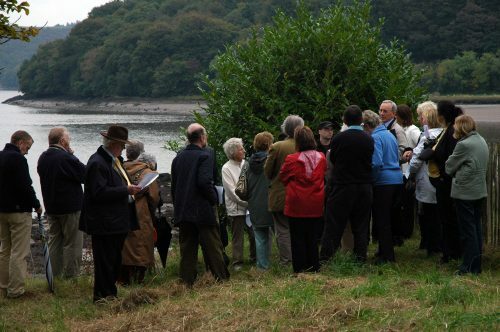 Dr. Walsh took place in Cove on last Tuesday, and on the following day the Parish Priests proceeded to the election of a Bishop. The first three names were Rev. T. Murphy, Rev. M. O’Brien, and Rev. William Keane. The first on the list will most likely be the Bishop, as indeed there could scarce be a reason for setting aside or passing by any of the three. The Bishops present were Most Rev. Dr. Slattery, Rt. Rev. Dr. Egan, Rt. Rev. Dr. Kennedy, and Rt. Rev. 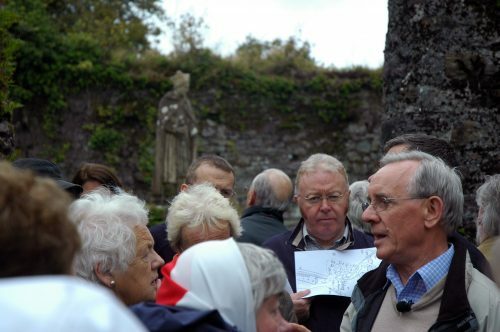 Dr. Delaney, that is, the Bishops of Cashel, Kerry, Killaloe and Cork. I was present at the Months Mind, but was not there on the day of the election. I have been this day at Ballymakeemore, where I took leave of my brother Pierce, who intended to leave home the next day, and set out for America. He was in good spirits, and from his good sense and steady habits, I trust he will succeed well in that country. At all events there appears but little hope for persons of being able to do any good in this misgoverned country now. A letter has been received from my brother, Pierse, who has dated it “Chatam, Upper Canada”. It is the first that has been received from him since his departure. He was in good health and spirits, just after having been for some time before sick for nine days. It is I find a long time since I noted any matter in these pages, not even the departure of the old year or the opening of the new. The people and the country are still struck down under the effects of the famine arising from four successive failures of the potato. There seems to be no hope of reviving life, and even the upper classes, especially those depending on landed property, appear to be moving too, to the verge of ruin. Out of this suffering good might yet arise to the great bulk of the population of this country, and if so, it will be by passing, surely, through a fearful ordeal. 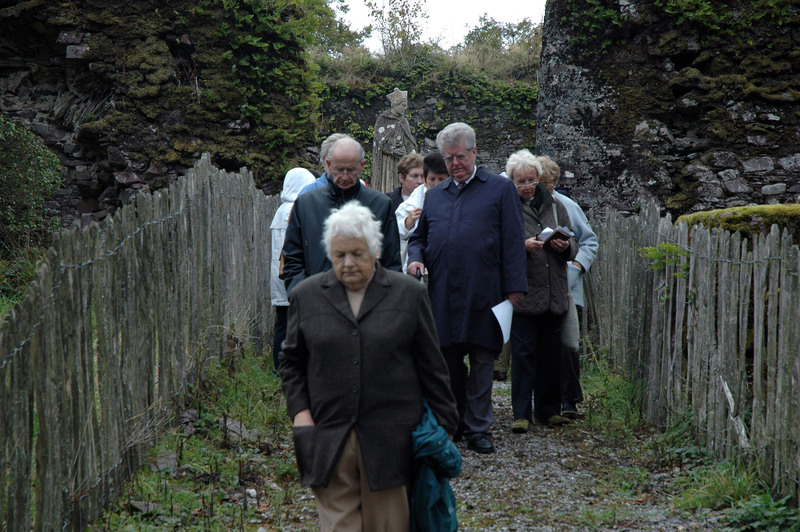 These are the effects of misrule and oppression – agents which have been for centuries at work in poor Ireland. May she arise, and may the morning of her resurrection be as glorious as the night of her doom has been long and dismal. Amen. There was a fearful visit from the cholera to this country and in fact to all Europe and America during the past summer. Many died of it in this town where it raged with particular virulence during the space of a fortnight, and lingered less fatal, for a considerable time afterwards. This has been a fine summer up to the present time, but perhaps a little dry, though that feature may perhaps be most favourable to the potato crop which appears very promising, and of which a portion has made its appearance already in our market. The town and country have been, thank God, very exempt from sickness this season, and in this respect, at least, the present time contrasts most favourable with the proceeding years. Another letter has been just received from my brother, Pierse, in America. I have been sorely afflicted by the death of an esteemed friend and college fellow this year, namely, the Rev. Cornelius Horgan, curate of Mitchelstown. He was a very intimate companion of mine in College, and it was in company with him that I travelled home from France after being ordained. He was a truly estimable man, and a most pious, zealous and faithful priest. The last time I saw him was in Cove last April, on his bed of sickness. Requiescat in pace. I have also superintended the printing of the Irish Catechism for the use of this diocese by order of the Bishop. It was done here in Youghal, and well executed by Mr. Linsey, Printer. England has been for some months past in a storm of fanatical phrensy in consecuence of the creation of the Cardinal (Wiseman) there, and the restoration of the Catholic Hierarchy. It is difficult to imagine how any civilised nation could at the present day exhibit so much brutality and besotted ignorance as England has done on the present occasion. The Catholics there have maintained a dignified position, calm and cool, and in their writings spirited and clever. May God bestow his graces and blessings on us and guard us from all the perils of the year. Amen. On yesterday I accompanied to the grave the remains of my poor brother, John, who died unmarried in about the thirty-fifth year of his age, at our mother’s house, Ballymakeemore. I was speaking to him a few minutes before his death on the day of the Annunciation. His sickness, which was not very long, commenced in Influenza. He was a very clear-headed and intelligent man, and of this he gave to his family a very useful proof in the erection of the small grinding mill on the farm which was designed and constructed and worked by himself, without ever having devoted an hour to the learning of any trade for that purpose. Requiescat in pace. Amen. This appears to be a fine and most promising season. The growing crops look beautiful. The potatoes as yet exhibit no sign of disease, and it is hoped that, with God’s blessing, we shall have a good crop of them. England is at present exhibiting its bigotry and infatuation in the passing of a penal law against the Catholics by way of repelling what they term “Papal Aggression”. That proud land may have cause to regret this yet, and that she may! 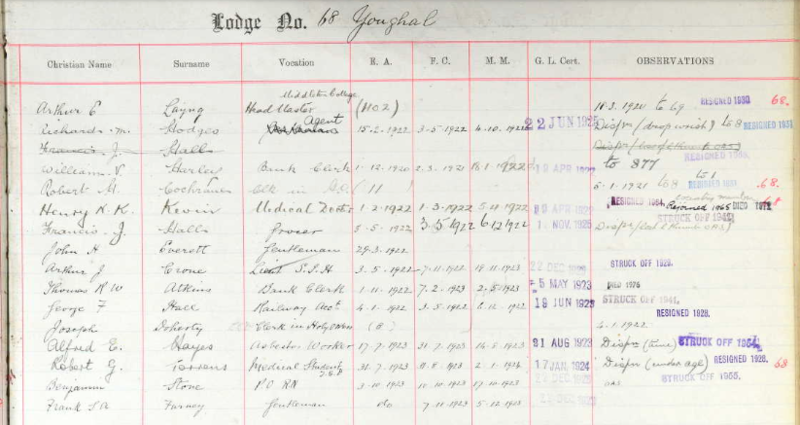 On the 16th of June last I was removed from Youghal to the town of Charleville where I am at present stationed. The Bishop, Dr. Murphy, in his letter, stated that “nothing short of the absolute want of my services in this new local could induce him to disturb me”. Well, I trust that upon these words I may put their literal construction, though certainly, the suddenness of the removal from a place where I had spent so long a time has surprised others as well as myself. But whether the change be for good or for evil, in a temporal way, welcome be the Will of God. A great blessing was bestowed upon me by Providence in the uninterrupted state of good health which I enjoyed for so long in Youghal (nearly twelve years) in the midst of famine, of pestilence, and of death. I thank the Lord for all His mercies, and I earnestly implore his protection against the uncertain future. 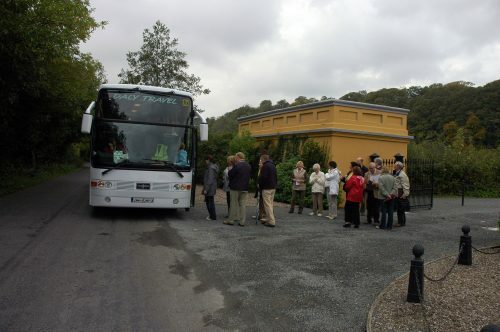 Last week I was at the spiritual Retreat in Fermoy. The spiritual lectures were given by the Rev. W. Gaffe, of the Society of Jesus, the lectures the previous week having been conducted by the Rev. Dr. Hely of the same society for another portion of our clergy. A few days ago there were rumours of blight in the potatoes, but it is now stated that they have recovered and are doing well. This mysterious disease has made its appearance in the country since the beginning of the month. The new species of potatoes are escaping best, though they too are touched, while among the old seeds the disease has even already committed very extensive injury. In many districts of the country a large portion of the harvest is already cut down. It is stated that the various grains, particularly wheat, have not been so good for many years. The penal law against the Catholics, which, its authors say, pretends only to repel “Papal aggression” has at length been passed in spite of all the manly and talented opposition which it met from Catholic and some Protestant members in both houses of Parliament. The Bill received the royal assent by commission on the first day of this month. It is a law the ultimate consequences of which probably no man can now predict; but its power for mischief is great. I have indeed but very little to add here since the last entry. The potato disease has gone on, even increasing, to such an extent, that the root, as it is stated, is in many districts worse than it has been for the last four or five years. Even at this inclement season of the year, is going on rapidly that emigration stream to America which has already drained this country of so many hundreds of thousands of its stalwart population. Many predict that in a few years this fine old country will be almost a wilderness, the lonely habitation of a few men and of multitudes of cattle. There were here in Charleville last month for two days, horse races which went off sportingly in the presence of a large concourse of people. And there has been the reception of a novice here at the Convent of Mercy which is a well-looking house. The community consists of ten sisters who, besides visiting the sick, conduct the national female school of the town, and also keep a school of their own, for the more respectable classes, at the convent. The impression produced in my mind with respect to this country by the residence of a few months there is to this effect, namely, that the soil is rich and luxuriant, the climate wholesome, and the people about as comfortable and as religious as they are in Imokilly, but not so industrious and hardworking, owing, probably, to the fact that they find it more profitable to depend for support on cattle rather than on the fruits of agriculture. Again, by the blessing of God, and His special favours and protection, I have arrived at the beginning of this New Year. The winter has, up to this, been unusually mild; and at present, if one did not know the season of the year, he would be inclined to mistake it for some other. The condition of the people is somewhat improved, but they are by no means recovered from the effects of the past disastrous years. I have, thank God, enjoyed most excellent health since I came to this parish, and, perhaps, ought to say that I was never better or more happy than at the present moment. 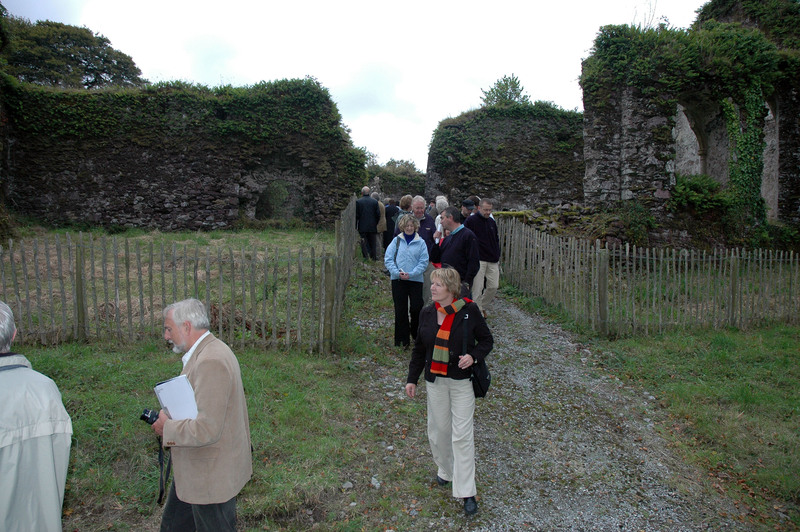 On last Monday, I went in company with two friends to visit Lough Guir in the county of Limerick. We had dined the previous evening at the house of Rev. Mr. Ryan, P.P., of Drummin, by whom we were kindly and hospitable entertained. About 10 o’clock in the morning we sat out for the enchanted lake, and got the first view of its waters at noon. The day was clear and beautiful. As I beheld the ruins of the castles that had once proudly stood on the little islands of the lake, and on the surrounding hillocks, the historic reminiscences of the place rushed on my mind, awaking feelings, at once, both of pleasure and of melancholy. 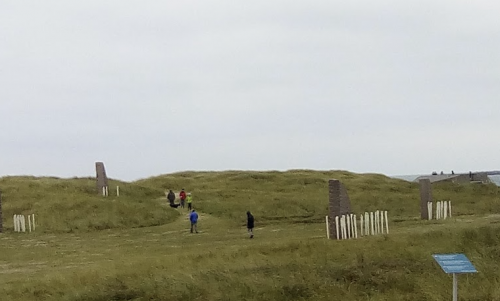 From time immemorial Lough Guir was famous as an extraordinary fortress of defence, as well as, for the battles that had been fought there both in attacking and in defending the position. 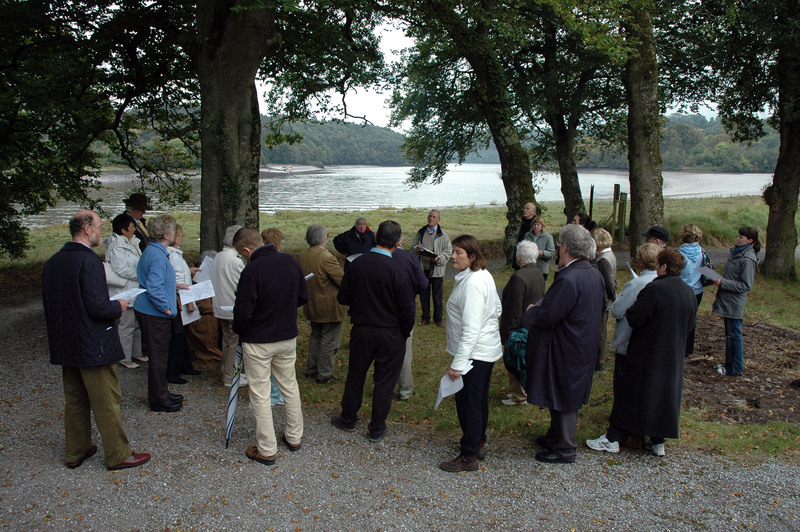 The ancient Druid too, in remote pagan times, often mused by the verge of its waters, as is evident from the presence there, even to this day, of a large druidical circle of stones which stands on the mainland at one end of the lake, and where the victim, perhaps human, had been often immolated. But it is in connection with the Geraldines of Desmond that Lough Guir now possesses its chief interest. By them the position had been wrested from some powerful Irish chief, and held for the English: but when they themselves were driven to rebellion it was fortified and defended as a place of security against Saxon oppression. The lake, which is very large, entirely surrounded a steep and rugged mound containing many acres, and chiefly composed of layers of large granite stones piled on each other in most regular order, by the hand of nature. The two narrow passes to this mound at the narrowest parts of the lake, were defended by strong castles and massive breastworks, of which the ruins are to be seen there to this day. At one time the place was wrested from the Geraldines by the English, and after the lapse of a certain period recovered by the Geraldines again. But at the final suppression of that powerful family, and the subjugation of Munster, the fortress fell into the hands of the English, and the castles all round were blown up with gun-powder. but that every one who had got a glimpse of him was fated soon to die. When he come round to the spot in the waters from which he emerges, he sinks down to sleep seven years more. It is further stated that the Earl’s horse is shod with silver shoes, and that when these are on the point of being worn out, the period of enchantment terminates, and the warriors are liberated to achieve the final victory of their country. When I said to the simple narrator of this tradition that I should like to see the Earl making one of his septennial races round the fortress, she looked at me with amazement, observing at the same time that “surely I ought not to be so tired of my life”. Such is the legend about Lough Guir. The name of this lake seems to me to be rather strange and puzzling. Lough Guir would appear to mean the Lake of the Hatching, but whether it refers to the number of wild fowl that breed there, or to some other more important circumstance, is what I have not yet been able to satisfy my mind upon. In the annals of the Four Masters it is called Lough Guir. The country in which it lies was anciently called Hey Connuil Gaura, that is, the territory of O’Connell Gaura? Goarr, too means bog peat of which the lake contains vast quantities. It may be Lough Guir, the Lake of Rock, from the large mound in the centre of it. Cair by use was probably changed into Gair. On yesterday evening I walked out through the fields towards Broghill. The country appeared beautiful after the late rain. I listened for some time to the cuckoo, which was giving out its notes from one of the ancient trees that stand near the ruins of the once famous castle of the Geraldines, the Lords of Tuath Brothail. The lands there are still rich and beautiful, but all the ancient glories of the place and almost all its historical reminiscences too are vanished. The present season promises and abundant year, which may the Lord realise for our long suffering people. I have visited the National Exhibition at Cork. I went to see the family at home last week, and had the happiness to find them all well. The weather being very wet, I was not able to visit any of my old friends in the neighbour-hood. For the last week or ten days, symptoms of potato disease have been making their appearance here. 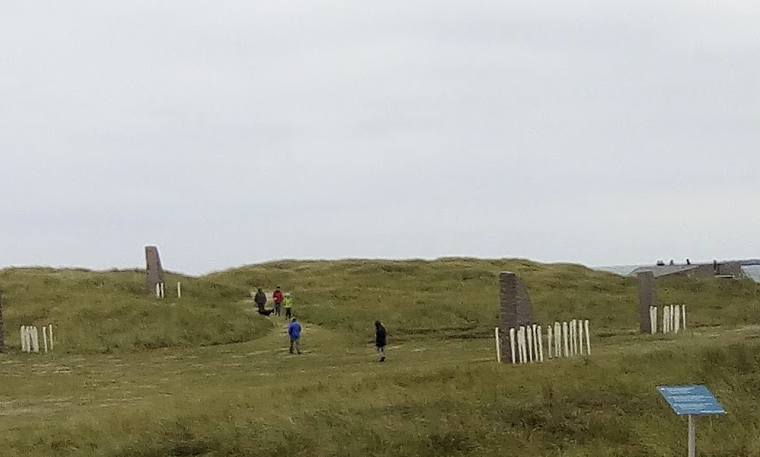 Still the crop has not yet suffered to any extent, but it appears that in Imokilly, and along the sea coast the disease has set in extensively, especially among the early plantings. Thus the evil comes earlier than usual this year, owing, perhaps to the wetness of the season. The blight is advancing here at an awful rate. Potatoes which only a couple of days since were good, are now all black. Some people are digging them all out for the market. I have just returned from a visit to my mother and family, with whom I have spent a very enjoyable week. The potato blight is found to have progressed to a vast extent this year. In Ireland there is not perhaps half the crop of last year: in England and Scotland they are said to be worse that any season since 1846. This is a most beautiful day. 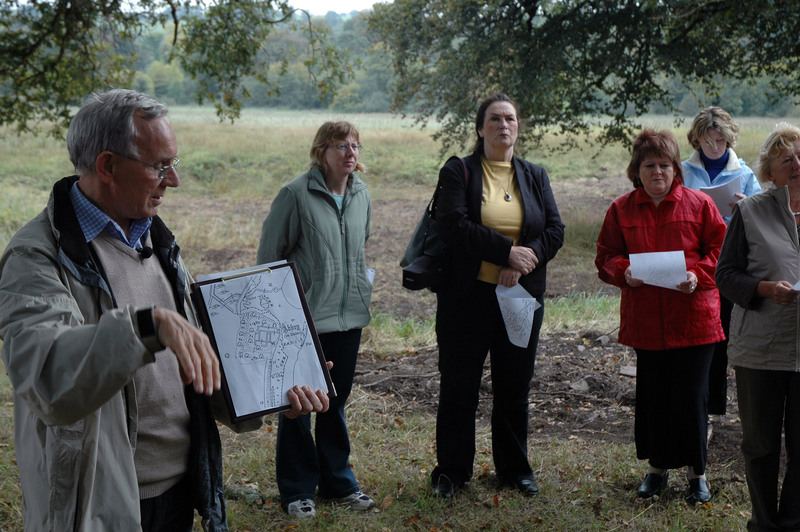 I have just returned from a walk through the fields in the neighbourhood of the Railway Station. On my way I started a snipe and saw two or three flocks of grey and green plover. The sun was shining bright and yet the mountains and distant country were half concealed by a dry fog which there was not a breeze to blow away. Two trains were in view, one snorting up an elevation towards Cork, and the other gliding down on the opposite rails for Dublin. They were not long parting company, and must be at a good distance from each other by this time. There were horse races here on yesterday and the day before. The second day was awfully wet and cold. No casualty occurred, beyond a few falls in the fences. Again by the mercy of God I have arrived at the commencement of another new year. This season has been unusually soft and wet, but there have been lately two violent storms that have done much injury by land, and must have produced terrible disasters at sea. Here however, the influence of them was not much felt, though indeed, many of the houses are rickety enough. March 24th, 1853. Holy Thursday. Last night there was a very heavy fall of snow, and the state of the atmosphere at present would seem to threaten more. I do not recollect ever having seen so much snow at this season of the year. There has been frost too, from time to time, within the last six weeks, but up to that the winter was extremely wet. Perhaps this change would bring about the natural fruitfulness of the seasons and banish that sterility and blight with which we have been afflicted in this country for the last seven years. March 27th, 1853. Easter Sunday. The frost and snow still continue on the ground, with a steady sharp wind from the north east. Possibly the same may not occur for many a long year again. The Bishop, Dr. Murphy, has held his visitation and confirmation here this week, and also in the neighbouring parishes. I attended at Liscarroll, Ballyhea, Newtown, and Kilbollane. We had here in Charleville 201 children for confirmation, well instructed in the Catechism. I have just returned from Dublin where I was to see the Great Exhibition got up chiefly through the exertions of Mr. Dargon. It certainly is splendidly brought out and well repays a visit to the Metropolis, even from this distant quarter. But Railway has made the journey now short and pleasant. I also visited the grave of O’Connell at Glasnevin. The place around it is pretty enough, but I trust the day is not far distant, when a suitable monument will be erected there instead of the present temporary memorial. On the 19th of last month I was removed from Charleville to this parish. I have reason to thank God for the good health I enjoyed in Charleville, and it is with regret that I have left that place and the people with whom I became acquainted there. I arrived in Mallow on the 21st. There has been a letter from my brother Pierse in America. He is engineer on a steamboat trading to Chicago, and he has a good prospect of rising and getting on well in that profession. For the last few days the potato blight has been making its appearance, but in a mitigated shape. It is more than a week since I saw the first of it here, and it has not advanced much since. The potato blight is now generally spread through the country, but it does not appear to be so virulent as it was in the past few years. I have returned from a visit to the family home. In that part of the country the potato stalks have almost altogether disappeared, and a large portion of the potato, perhaps one-third is rotted. The potato blight is at present doing much injury to the root here about Mallow. The month of October just passed was very wet. In consequence of the almost perpetual rain there arose yesterday morning in the Blackwater a flood greater than that had been witnessed for the last century or two. It was flowing over the battlements of the bridge. 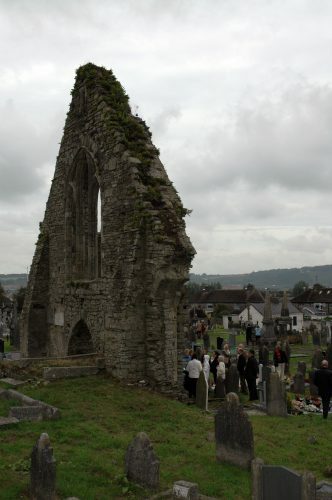 It reached up to nearly half the grave yard attached to the Catholic chapel here and submerged the lower part of this town up to the very roofs of the houses. Four persons were drowned in their houses. Cattle and corn were swept away. Were it not for the Railway mound, which broke the force of the water and partially checked its progress, the damage to the town would have been still much greater. On the river both above and below Mallow, some very strong bridges have been swept away. Patrick’s Bridge in Cork was carried away on the same day by the flood and a number of persons who were standing on it at the time were drowned. By the mercy of God and His kind providence, I have arrived at the beginning of this year in perfect health and vigour. May His grace and protection be always with us. I have just returned from home where I was invited to be present at the marriage of my sister Mary, to John Ahern of Dungourney, which took place at Mother’s house on the day before yesterday. I trust in God she will be happy. She was a sensible and good girl. To-day for the first time this season, I have heard the voice of the cuckoo. His visit to this country has been late this year in consequence of the sharp ungenial weather. There has been now nearly if not fully, three months of continued dry weather, with the exception of a few showers that have lately fallen, and as this too is generally the case all over the continent of Europe, it is feared that the harvest will be deficient. And to add to the gloominess of the prospect, there is now going on between Russia, on the one side, and Turkey, France and England on the other, a war, the end of which no man can foresee, nor calculate the fearful consequences. It still may be permitted to hope that it may ultimately be the means of bringing about some good for poor persecuted Ireland. Amen. The month of May, just passed, has been, during the latter part of it, sufficiently moist, and though much heat has not been yet felt, it is hoped that a useful effect has been produced on the crops, and that an abundant harvest may be expected in this country. In some places and particularly here there have been hail showers one of which covered the ground with an inch of solid snow. For the last week or ten days appearances of the potato blight have been observed in this country. Though considerably on the increase since, the disease is at present only very light, and good potatoes grown near Cork, are every day selling in this town. I have just returned from a visit to my mother. The blight is spreading in that country – but at present they have very good new potatoes. The potato blight is spread through the whole country, and appears to be very severe. Along the coast the branches of the stalks have almost all disappeared, and it is stated that the root is rotting in the ground. All think that the disease is worse than it was last year. I think this day is the warmest day I have ever felt in this country. Yesterday too was very hot, but I did not feel it so much as I spent it on the mountain of Cloughboula, where I shot two hares and one grouse. How the years are creeping upon us! And we behold their effect on ourselves, and on those around us. Until a person reaches the meridian of life all is lively, fresh and hopeful, but after that the sun begins clearly to descend too, as it does at this season of the year, quickly amidst a shade of gloom and melancholy. Every day now appears to add a grey hair to the head, and to steal away a portion of its vigour from the sinew. I know not whether it is any feeling on this head that makes me a little gloomy at the present moment. It may be, however, a loneliness arising from my isolated position, and which yet may be dissipated in the sunshine of friendship and social activity, that is, if such things should ever be destined for us. The news that Sebastopol was taken has again been contradicted. The potato crop is regarded as very deficient. The cereals are good, though the prices of provisions run high, far too high for the comfort of the poorer classes. Still, there is pretty good employment for all here, and a prospect of better. The warlike proceedings in the Cremea, of which no one can foresee the result or the end, must affect labour and wages in this country. The weather is very mild for this season of the year. No frost, no snow, nor much rain. There was a very large number of communicants here at the three Masses. For the past few days we have been much occupied in the confessionals, as the Jubilee which has been going on for the last three months is just about to terminate. Thanks to the great God, I have arrived at the beginning of another New Year. Perhaps the most important event of the past year was the defining and proclaiming of the Immaculate Conception of the Blessed Virgin, which took place at Rome on the 8th December in the presence of Bishops from all parts of the Christian world. A war with Russia has been going on, from which England, as yet, has reaped but little glory. It may perhaps be intended in the designs of Providence to teach that proud, vain, boastful nation a lesson that may perhaps deter her in the future from proclaiming the great superiority of the Anglo-Saxons over all other races, and especially the Celts. This morning the snow was six inches deep on the ground. It came down calmly and without much cold during the night. For some days previously there had been a smart frost, up to which time the winter had been extremely soft and mild. From the last date a large amount of frost and snow has been on the ground. There is now a thaw. There has been another heavy fall of snow today. The trains from Dublin have been all stopped by it. Frost also again. This day the River Blackwater was frozen over, from bank to bank, from Mallow bridge all along up to near the railway viaduct. The oldest inhabitant says that the river was similarly frozen over about 40 years ago, but he does not think that the ice was then so thick and strong as at present. Very likely the worthy old man will never witness such a phenomenon again. There was a very heavy fall of snow last night. It is also snowing all this day, wind S.E. b. E. Nearly a foot of snow on the ground. This is a bright sunny day and all the more agreeable on that account after the two gloomy days that have just passed. In some places the snow is four and five feet deep. The trains from, and to, Dublin, having been obliged to stop here the town is full of weather beaten travellers. They will soon, however, have the comfort of leaving, as a great number of persons are employed in clearing the line. This day I walked from bank to bank over the Blackwater on the ice above the Mallow bridge!!! For the last two or three days there has been a rapid thaw. The ice disappeared as if by magic, from the Blackwater, having been raised up and broken by the increase of water from the melting snow. The thaw commenced here on the 21st and immediately the smaller birds, especially the little robins, commenced to sing. No note is even still heard from the thrushes or blackbirds, which indeed have to deplore a large number of their tribe that perished by the frost and snow. Most likely we, who are now living shall never again behold so severe a winter, that is, if a period of forty years (1814 before) is to pass by such a season returns. It is now ascertained that vast numbers of birds, plover, thrushes, blackbirds, snipe, larks, curlew, woodcock, etc. etc. perished in the late hard weather. The crows saved themselves by killing and eating the smaller birds. Never in the memory of those living did the country appear so denuded of the feathered tribes of so devoid of their songs. This is the first warm day we have had this year. The sun appears at last to be gaining the victory over the snows, the frosts, the iceberg, and the piercing winds. It has now been ascertained that most of the Bay trees in the country have been destroyed by the frost. A large portion of the furze too has been killed, and its blossom at this season is very scanty, few and far between. For the last five or six days the potato blight is appearing in different parts of the country; but it is so light and making so little progress, that much fear is not entertained of the crop. Only very few potatoes (new) come to the market here yet. A reluctance to touch on the death of my poor brother Pierce (of which melancholy event we received intelligence last September) has kept me for a long time form entering anything in this Diary. The poor fellow, who was the youngest of the family, died, as we are told, in Detroit, America, on the 25th December, 1854. 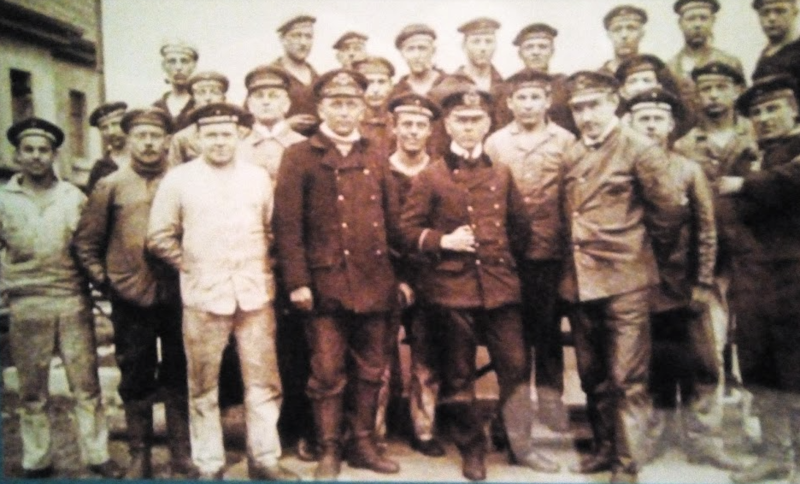 He was trading from that city to Lake Superior, as chief engineer on a large steamboat, and in the very last letter we received from him, he spoke well of his position and prospects. He even declined an invitation conveyed through me by his mother to come home, or rather expressed a desire to remain in that country for a year or two longer. Now the poor fellow’s expectations and ours have been sadly disappointed. The sudden intelligence of his death threw his mother into a state of gloom from which she is only now recovering. The Will of God be done in all things. He gave and he has taken away. We have reason to be grateful for many graces and mercies. The following is his signature to a letter written to his mother from Detroit, December 1853. Finding that the original pages of this diary were very nearly being exhausted, I have added others which make the little book larger, though certainly not more handsome. In all likelihood another addition to it will not be necessary, for according to the progress hitherto made, there is now ample room for the incidents of many years. What will be the fate of this peace now bring concluded in Paris when the following pages shall have been exhausted? “Amour a la plus belle, Honneur au plus vaillant”. On this day I and my dog “Quiz” crossed over the new bridge here from which they are striking the centres at present. It appears to be a very fine piece of work. The old bridge which it has replaced had stood there for nearly two hundred years, as appeared by the date (1633) on a stone under one of the arches, with the name Cromel, apparently that of the architect. This is the warmest day we have had this year, and must be exercising a most beneficial influenced on the crops. There is a report among us here that the potato blight has already to a considerable extent, appeared along the sea coast, but in this locality there is scarce any indication of it yet. Our crop however, is not much advanced to maturity. We had Confirmation and Visitation here in the month of June. All passed off well. 500 confirmed. For the last four or five days the weather has been excessively warm. It is stated that the temperature in this country has not been so high since the year 1825, and some talk of the reappearance now of the great comet of 1556. This latter statement has not however yet been sufficiently proved. The potato disease, which has appeared in various localities has been checked by the dry hot weather and, in consequence, it is expected that the esculent will yield a most excellent crop. All the other crops promise well too, with the exception of the turnips, to which the dry weather has been very injurious. For the last two days, also, the weather has maintained its high temperature, the thermometer having been at intervals, 80 degrees in the shade, and 112 in the sun. To-day, however, the heat has abated considerably, and there is a pleasant fresh breeze, but no indication of rain. This day the rain is falling soft and calm, and is, of course, gradually reducing the temperature. I have just returned from a visit to my mother and her family. The potato in that part of the country is excellent, and promises to yield a very fine crop. There is some blight on the stalks, and even some of the roots are black, but the injury does not threaten to be very extensive. There are scarce any apples this year. I have, through the mercy of God, arrived at the beginning of another year in perfect health and vigour. There has not been much to mark the progress of the past year in my own regard at least, but many things of an important public nature have taken place amongst us. We have seen the end of the great Russian war, and still feel in taxes and high prices of provisions, the consequences of it. Still the condition of almost all classes in this country has made no small advance in the line of improvement in the past year. At the present moment this our diocese of Cloyne is without a Bishop, Dr. Murphy having died of paralysis last December. May God send us in his stead a good, a wise and a worthy man. Amen. I have just returned from a visit to my mother’s place, where I was very sorry to find my poor brother Michael in a low, and I fear dangerous state of health. In every other respect all was well. My worst fears have unfortunately been realised with respect to my poor brother Michael, and I am scarce able even at this distance of time from his death to note here my feelings of that melancholy event. He died on the third day of this month. I had the consolation, a sad a melancholy one, of being present at his last moments, for on the Saturday before, that is, two days before his death, he wrote me a line himself saying that he was just after being anointed, and to use his own words, that “he wished to see me and have a little talk with me before leaving”. Poor Michael was a man of very strong and clear intellect. He had taken a part with his brother John, in the construction of the mill at Ballymakia, and was able to repair, arrange and work it as occasion demanded. He was able to survey, construct sundials, and write well, and of course, he was acquainted with all the business of a farmer. In any circumstances the death of such a brother would have been a great affliction, but where there was almost no one left to represent him, the loss may be said to be irreparable. He died unmarried about perhaps 38 years of age. On the opposite page is his signature as attached to one of his letters to me. He was the first to invent and construct the fan, or machine, now so generally used for blowing the kitchen fires in Imokilly. I well remember the time when he was occupied in constructing the first of them at his mother’s place. May God have mercy on him. Amen. On the 3rd of this month I was appointed Parish priest of Aghada, Ballinrostig and Saleen, by the Bishop, Right Rev. Doctor Keane. The uneasiness and trouble occasioned by the affliction of last March have not yet left my mind, and thus this change produces little emotion in me. I have been presented with a purse of gold and an Address by the Catholic people of Mallow amongst whom I passed four years as their Curate. The people to whom we minister are always good and grateful. Owing to the many things that occupied my attention after coming to this parish, more than a whole year has passed since the last entry in these pages. Thanks to the mercy of God, I have enjoyed good health during that time and succeeded in making some improvements that were necessary in the parish. I have got up a female school in Whitegate, repaired the school-house at Saleen. I have finished the tower of the Aghada chapel, and am at this moment putting a large bell, 6 cwt., in it. I have fenced the chapel yard of Ballinrostig and planted a large number of trees and quicksets there. I have also furnished the chapel with a new altar, platform, and a large altar figure, a crucifixion of a large size in statuary. The chapel of Saleen too, has been put in order. As there was no suitable house for myself in the parish when I came there, my present residence, to make it habitable required considerable improvements and outlay. All has been done in a satisfactory manner, thanks be to God. During some weeks of the past year a large comet was visible, at early dawn and late in the evening; a striking object! Up to the present time this winter has been mild. There has been very little frost or snow, but a good share of rain with heavy gales of wind. This has been a very dry and hot summer. At this moment the thermometer stands at one hundred and one degrees in the sunshine on the wall of my garden here. For the last three or four days slight indications of the potato blight appear in this neighbourhood. We are however digging out good new potatoes. The bawn-fields are brown from the drought. On yesterday and the previous day the Bishop, Right Rev. Dr. Keane held a visitation in this parish. There were two hundred persons for Confirmation. 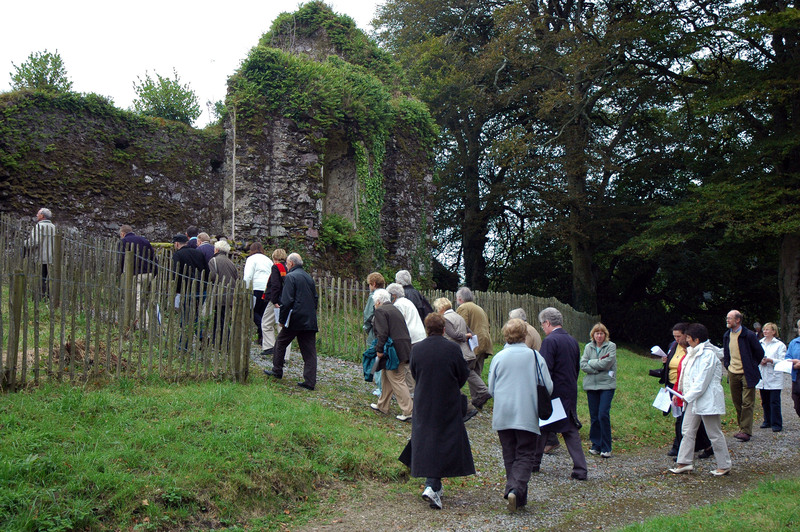 The visitation was held in the chapel of Ballinrostig, where there had not been a visitation for many years before. The chapel looked well with the newly erected galleries. The past winter has been one of the wettest and wildest that has been experienced in this country for many years. There is no date for the pews but they are certainly 19th. century. According to reports they were made from pitch pine that was salvaged from the cargo of a wrecked ship. Three carpenters, a father and two sons called Galwey, came from Ballyhea to make the pews and new doors. They lodged in local houses while the work was being carried out. The bell was cast in bronze by J. Murphy founders Dublin 1893. There are reports passed down orally of a previous bell which was a ships bell hanging from a tree in the church grounds. No doubt it would have come from one of the many shipwrecks in the area. Perhaps the same one that yielded the wood for the pews. Major renovation work was carried out in 1932/33. 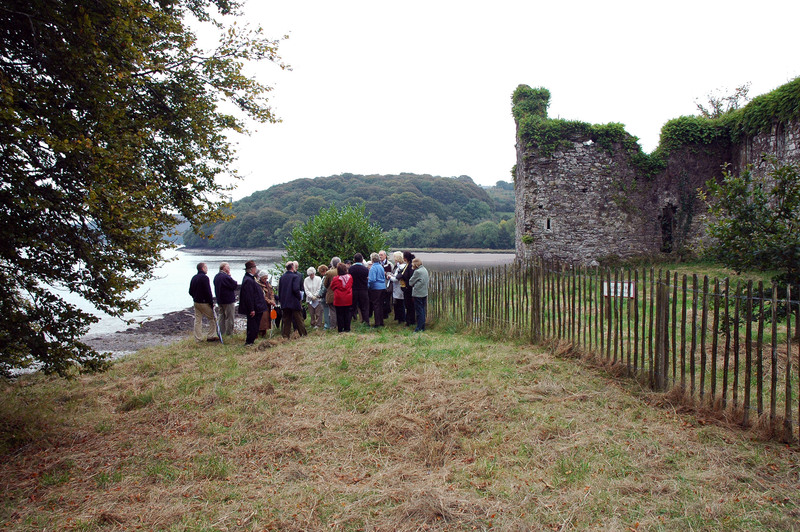 Murrays of Youghal were the main contractors. Rev. Fr. J. A. Keating was PP. o Removal of the galleries, part of which may have been used in the old church in Aghada Most of the timbers were sold by auction and used in farm buildings around the area. o Plastering inside and out. o Stable converted to mortuary. o Ground work, drainage and removal of trees. 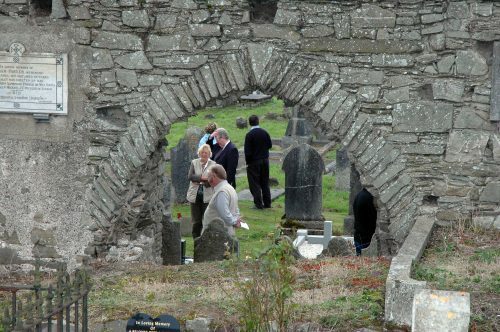 The building in the churchyard is known to this day as the mortuary. Prior to this it was known as the stable or car house, which was used to house the Priest’s horse and trap during Mass and other ceremonies. It was converted to a mortuary during the 1932/33 renovations, but for some reason only one body was ever waked there. Perhaps it was considered to be too far from the church. It has had many uses since, mostly as a store. During the 1950s/60s trainee altar boys got time off school to go there to learn Latin. Once they had it off by heart they were prepared to be fully fledged altar boys. Holy water was blessed there on Easter Sunday mornings and stored in an oak barrel for the year. The mortuary door was the traditional place for the blessing of palm and the starting point for the Palm Sunday procession around the church. Mary Sweeney was sacristan for most of the 20th. century. Pope Paul VI awarded her a gold medal and certificate in November 1963 to celebrate 60 years of dedicated service to the church. The presentation was made by Rev Fr. Patrick O’Mahony P.P. in January 1964. Two days later the ceremony was re-enacted for the television cameras and shown on Telefis Eireann news that night. People travelled to neighbouring houses to see Mary, as televisions were rare at that time. She continued on as sacristan until her death in 1970 aged 90 years. Her grandmother, mother and sister Margaret preceded her as sacristans. Stories were told of how Margaret would examine the soles of the altar boys boots before mass for nails as they would scratch the polished steps in the sanctuary. Her brother Jim, a Royal Naval pensioner, was bell ringer until the time of his death in 1968.
o Removal of the altar rails. o Marble altar refashioned. Work carried out by Sheedy Bros. Midleton. o Old tiles on main floor covered with asphalt and retiled, woodblock placed over concrete base in the sanctuary area. Work carried out by South of Ireland Asphalt Co.
o New stained glass window fitted. Donated by a local family. o Stone drains replaced by pipes. o A life size crucifix was found under the sanctuary when the floorboards were removed. 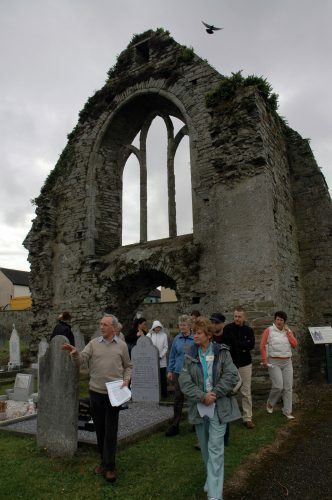 At first information as to its origin was vague but Mary Sweeney recalled hearing about a crucifix being removed from the old church in Rochemount to Ballinrostig. There was no information as to when it was placed there or if it was ever displayed in the church. An expert examined it and found it to be unsuitable for restoration, so it was placed back in its original position along with any information available about its origin for a future generation to discover. A newspaper report at the time stated that a tabernacle door was also discovered but apparently this was incorrect. A tabernacle door of unknown origin had been stored in the mortuary for many years. There was speculation that it may have come from an earlier tabernacle in the church. o New Christmas crib 1960.
o Exterior painted for the first time 1983.
o New car park 1983.
o P.V.C. windows fitted 1998. Tribute should be paid to the many people who donated artifacts most of whom wished to remain anonymous. A lot of work earned out down through the years was done by voluntary labour. Tribute should be paid here also. Since the Festival of SS. Peter and Paul the weather, which up to that period was wet, wild and ungenial, had taken a favourable turn. For the last few days the weather has been hot and genial. The mysterious potato blight has made its appearance earlier even than usual, owing, it is thought, to the wet and the cold. For the last fortnight, it has been noticed in this district, and even for some days before that, it had struck down patches of potatoes here and there. The past summer was unusually wet and cold. In some places the harvest was not saved till November, and in the mountainous districts it has proved a total failure. The potato too has been very generally blighted, though some fields here and there have yielded a good crop, and these have been mostly of the late sowing, contrary to what occurred in previous years. The season continues wet and mild up to the present. In my own career there is scarcely anything to notice. I have been so tied down to home for the last three years, and the country presents so few novel incidents that a word on self would only include the usual business of chapels, schools, stations, catechism, sick-calls and pastoral visits, some of an agreeable, and some of a disagreeable nature. I find that more that a year has passed since I noted down anything in this diary. I have reason to be thankful to the Almighty for the continuance of the great blessings of health. The last summer was even colder and wetter than the preceding one, and the consequence is that much distress exists in many parts of Ireland at the present moment. For the last sixty years there had not been so bad a season for crops of all kinds. The farmers have suffered severely and will require some two or three prosperous seasons to regain their lost ground. In this neighbourhood the working class and their families derive great benefit from the employment given them at the Fortification works at Carlisle Fort. The Telegraph too, which is being established from Roche’s Point is putting money into the hands of those employed about it. In the course of last summer I visited the ship called the Great Eastern, which had been obliged to put into the harbour here in distress, on her outward voyage to America. This summer has been very wet and cold. The harvest will be late, and it is feared that the return from it will not be very satisfactory. The potato is blighted as usual this year, but as yet the root is of excellent quality. The week before last I was at the Spiritual Retreat at Fermoy. The health of my mother, who has been suffering from nervousness for the last three months has been to me no small cause of anxiety. We have had a Visitation and Confirmation by the Bishop, Dr. Keane, here this year. One hundred and sixty nine children were confirmed. All passed off well. It is an immense long time since I made the last entry in this diary. The restoration to health of my mother has been a great consolation. During the past four years I have made important alterations and improvements in the Chapel of Aghada. It has been wholly ceiled in timber. A new portion has been built behind the old altar, and a large and decent window of stained glass has been placed there. A new altar has also been put in the new sanctuary, and the interior of the chapel altogether improved. An additional piece of ground has also been procured for the chapel-yard, and the school yard, and this has been well fenced in and planted. As the trees grow up the whole place will soon present a decent and respectable appearance. I have had a visitation by the Bishop, and also a Jubilee within the last three years. We went to assist the clergymen at Queenstown at the Jubilee and they came to assist us. All passed off well. The last summer was fine and dry and warm, but the winter up to this has been wet and tempestuous. There has not been much frost or snow in this part of the country. A partial blight fell on the potato crop last season to an extent which made it perhaps only about one half of the crop of the previous season. Emigration to America has been going on very extensively through Ireland, but the tide has not as yet set in much in this part of the country. The vessels calling at Queenstown for this purpose have been carrying away hundreds every week. It is not easy to see what influence this state of things will ultimately exercise on Ireland and her people. It is a long time since I made an entry in this diary. As one grows old he becomes careless of passing events. On the 12th of last March my uncle, John Kennedy, died, aged 87 years. 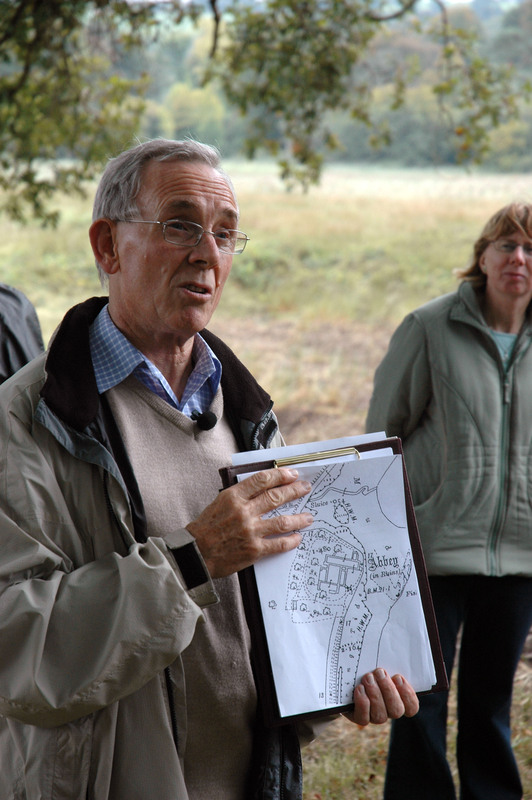 He was a sensible and intelligent man who maintained a respectable position as a farmer to the end. He died at Dungourney. We have had the Bishop, Dr. Keane on his Visitation here this year. The chapel of Saleen had been put into good repair, and he complimented the people of that part of the parish on the subject. Among other improvements was the erection of a handsome stone cross on the south gable, facing the road. I find that it is a very long time since I noted anything in this diary. So many things have occurred during this period that I know not now with which to commence. But the death of dear friends is that which cannot fail to come foremost to the mind. My old friend, Rev. Robert Riordan, who, I may say, was the first to put a Latin Grammar in my hands, when he was Curate of Killeagh, my native parish, has passed away. He was a kind-hearted good priest and was P.P. of Kilbolane for many years before his death. Since I had come to Aghada he was in the habit of spending some weeks with me every summer for the seaside breezes and the water. Another friend and dear relative Rev. David Coleman has also passed away. He died on 6th, March, 1873 at his brother’s house, Bridgefield, and was at the time Curate of Kanturk. He too was in the habit of spending some time with me here every summer. I shall long miss his portly figure and good humoured and cheerful face. Doctor Keane the Bishop of the Diocese has passed away, and is succeeded by Doctor McCarthy my old friend and once fellow curate who too has often come to spend a few days with me here in summer. A work of some magnitude and of considerable expense has been executed by me here. I have built a parochial house near the old presbytery, erected a pump in the garden, and put up some outoffices in connection with the house. All the work was done at my own expense. I expected to be able to borrow money on it from the Board of Works, under the Parsonage Act. This I was not able to accomplish as the Bishop was sick at the time and his signature was required for the legal document. The period to which the Act was limited is now run out. I know not whether the Act will be renewed, and, if not, how recompense for the outlay will be obtained. My principal object in undertaking this work was to secure the house and place for the parish. 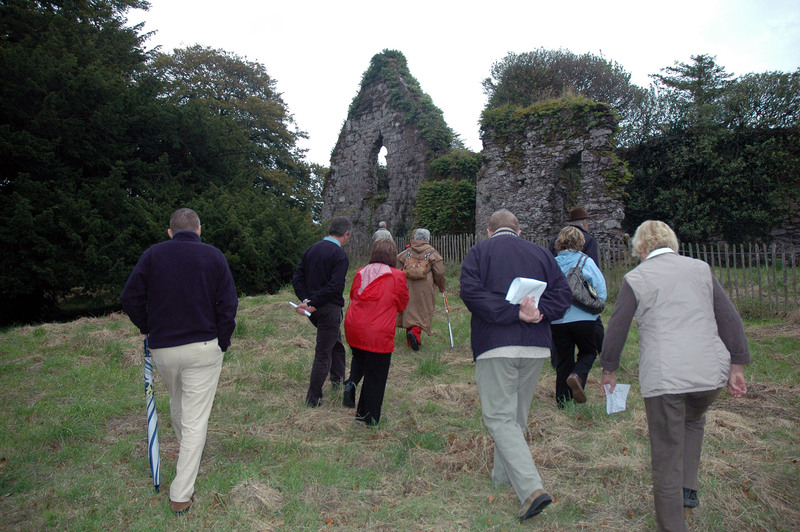 The old presbytery was in a very dilapidated state, with the east gable and side wall in danger of coming down. I found out by an extract from the Will of the Donor, Mr. John Roche, that to secure the house and place for the parish, it was required as a condition that the priest should actually reside there. I had no confidence in the actual representative of Mr. Roche, for I suspected that he had his eye on the place, and thus I resolved to secure the bequest against this danger. I have planted trees and shrubs in the fence behind the Chapel school and parochial house and these have now grown up to be very ornamental. They are also a great shelter to the place. An event of great concern and sorrow to me has taken place this month. It is the death of my dear Mother, which took place on the 12th inst. at noon, and rather unexpectedly, at her residence, Ballymakeigh. She was in the 91st year of her age, and up to last New Year’s Day was able to go about and attend to her business, as usual. Since that period she felt very weak, and though there was no sickness or pain she was growing more feeble every day. She took to the bed more than ever in her lifetime before, and though she spent some hours up occasionally her former vigour never returned. Her mind was clear and collected to the last. Even the day before her death she was reading the newspaper which I had sent and collected to the last. Even the day before her death she was reading the newspaper which I had sent her on Saturday from Aghada. On Monday, the day of her death, I was at Retreat in Fermoy and got the sad intelligence by telegraph. It was a severe trial to me in the circumstances. She was a woman of great energy and industry and intelligence. For many years she had to provide as a widow, for her large family, and the death of four of her sons obliged her to attend to the care and management of her farms up to the period of her death. We thought she should never leave us, she was so good, and as we felt, so necessary a portion of our existence. May God grant her eternal rest. She was dressing herself and was being helped by my sister Mary, when she said, “Something is coming over me” and died in an instant. It was the fall of the Leaf. Rev. R. Canon Smiddy died 11th June, 1878. Rev. R. Canon Smiddy’s family are buried in Killeagh Graveyard, Co. Cork, Ireland. Rev. 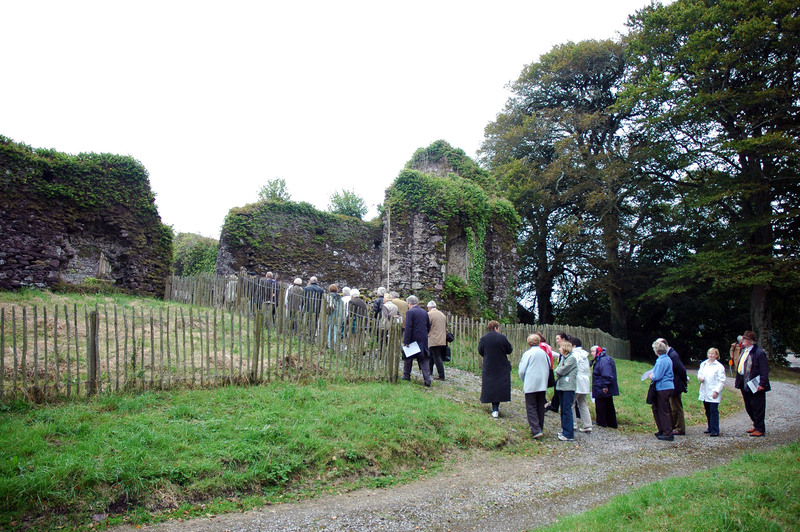 R. Canon Smiddy is buried in Aghada, his last parish. Thanks to Kevin F. Hunt for the above who is related to V. Rev. Richard Canon Smiddy. www.rootsireland.ie – www.nationalarchives.ie for Tithe Records & Griffith Valuation. 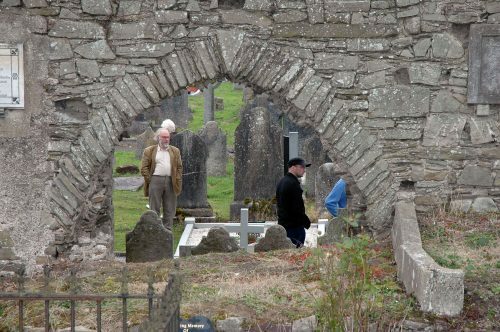 www.corkarchives.ie & www.corkpastandpresent.ie www.historicgraves.ie (has a memorial for a Dr Thomas Gallogly d 2nd april 1865 Shanrahan Graveyard Clogheen Co Tipperary. 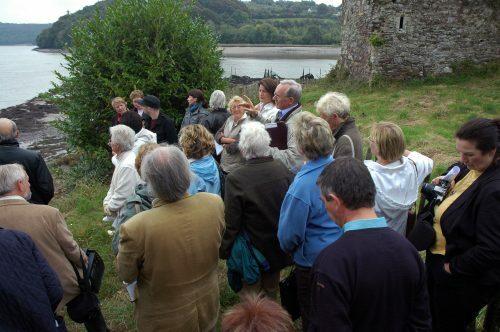 This entry was posted in Family History Searches and tagged Famine Diary on June 12, 2018 by Youghal Celebrates History. This entry was posted in Family History Searches on May 29, 2018 by Youghal Celebrates History. Give us a RECITATION ! Culture Night has become a feature of the year all around Europe. Events are free, people ramble around from venue to venue and all sorts of activities form part of the evening’s activities. 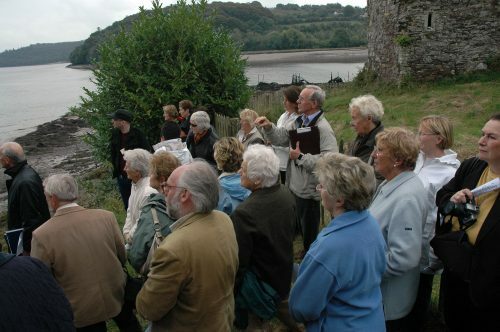 Youghal Celebrates History is offering a pleasant nostalgic evening called “Give us a RECITATION!”. 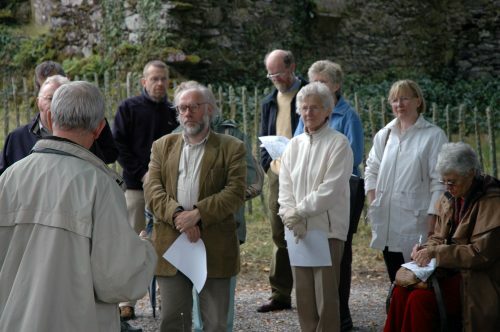 We have invited people to name their favourite recitations and we have people ready to recite them – old recitations and new, well known and not so well known. In the past everybody had a song or a recitation. This will be a night of recitations. The Green Eyed Idol north of Katmandu. You get the idea, I hope, everybody had a favourite recitation – If you have one, let us know . If you would recite it all the better!!!!! Culture Night is FRIDAY 22nd of September. Youghal Celebrates History will be in Tyne’s Castle from 7.30 onwards. There are lots of other events planned for the night – Cork County Council will have a brochure advertising the events. Don’t miss it!!!! Our friends in Community Radio Youghal, in the Little Theatre Group of Youghal are willing to help out. Join us ! This entry was posted in Conference and tagged Culture Night, Recitation, Youghal Celebrates History on July 4, 2017 by Youghal Celebrates History. Available in all good bookshops. But if you can’t get them in your local bookshop …buy them here. It is safe and uses Shopify as the sales method. 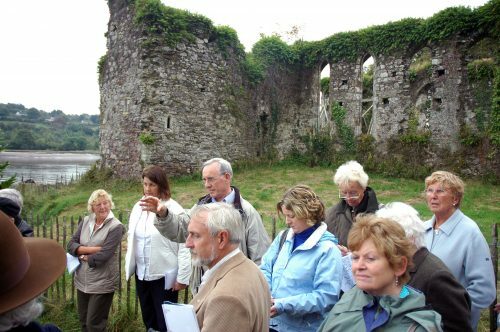 This entry was posted in Archive on February 8, 2017 by Youghal Celebrates History. 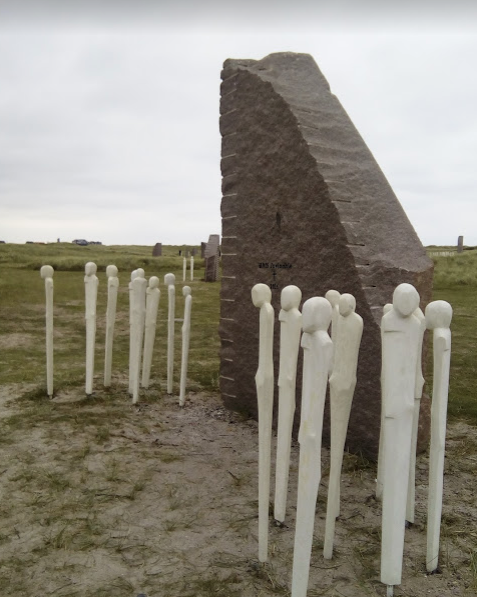 This is the memorial in Thyborøn, Jutland, Denmark to the Battle of Jutland – probably the greatest ever sea battle in the history of world. 25 ships were destroyed in one day and just under 9,000 men died when two incredibly powerful navies faced off. Each stone represents one of the ships lost and the little figures in white, represent those who died. It is a project in the making. It is hoped one day to fill the dune with the full number of little white figures, just under 9,000. The battle took place over 24 hours – between May 31st and June 1st. 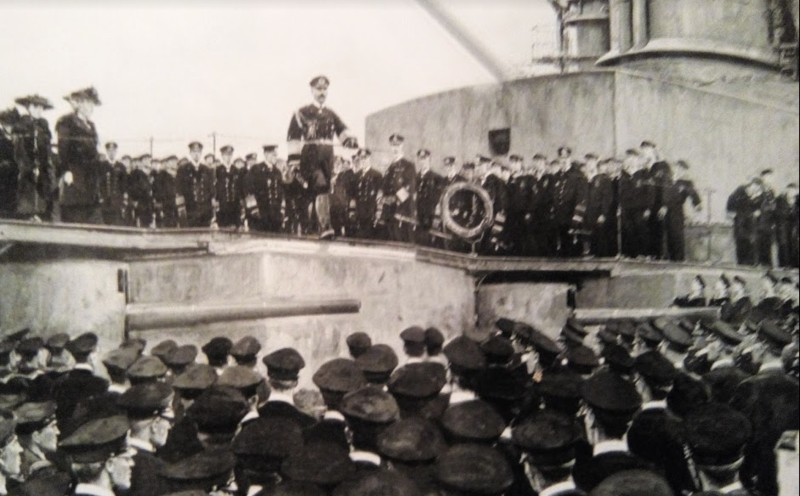 250 ships and over 100,00 men faced off and for 24 hours kept up a barrage of big guns, torpedoes, small fire. 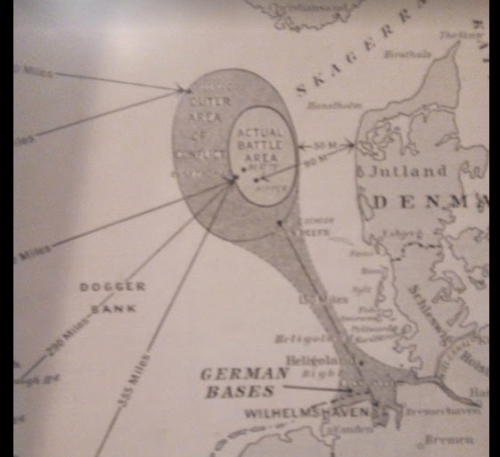 The museum , called the Sea War Museum of Jutland, is the town of Thyborøn. 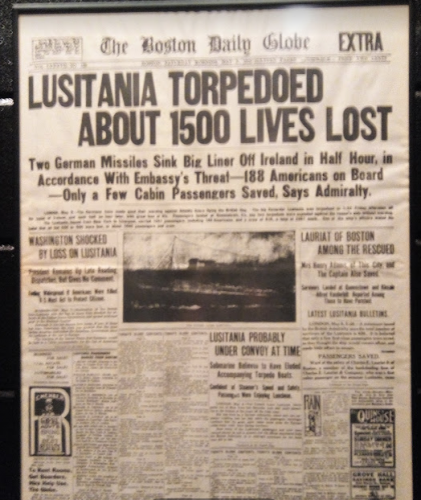 The nearest airport is Billund ( home of Lego among other things), hopes to add more Irish stories of the Lusitania. If you can help with stories, titles of books you could recommend please let us know. If you have photos you might share them with us. The map below gives you an idea of where Jutland is (just in case!). 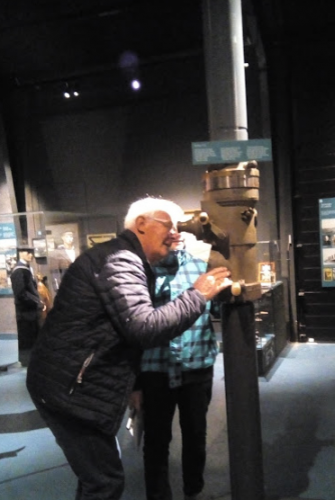 There is another museum a few kilometres away dedicated to other shipwrecks because the coast of Jutland has proved to be a graveyard for hundreds and hundreds of ships over the centuries. 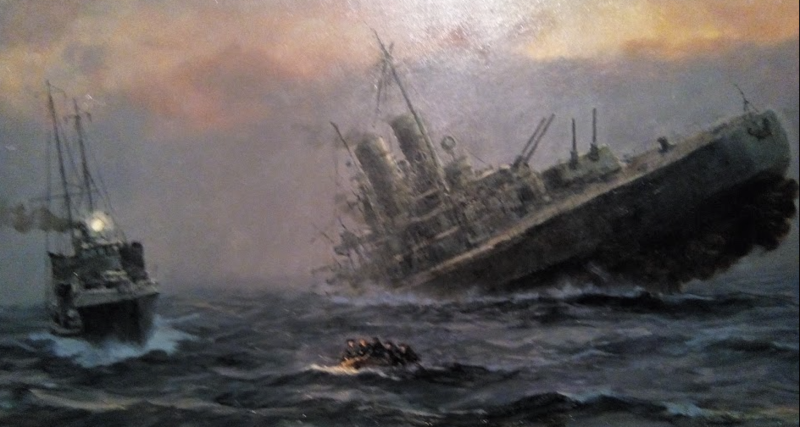 The nearby museum contains much of what was salvaged form the wrecks of the ships, plus paintings and photographs of the battle. 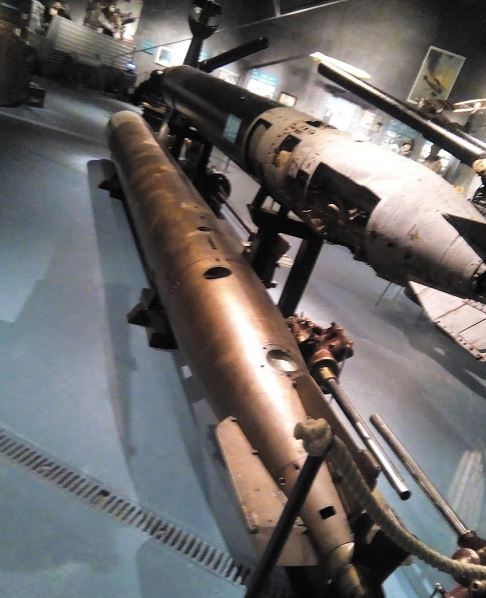 From an Irish point of view, the U2 submarine which sank the Lusitania is there – parts of it -the conning tower, some memorabilia, the periscope, the little flag created as a memento of the sinking of the Lusitania and some newspaper accounts from the time. 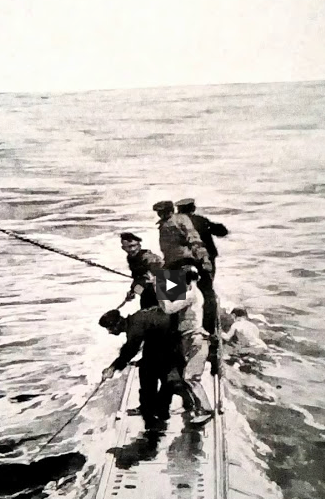 The submarine was beached on the shores of Jutland some time later and parts were salvaged. This is the crew of the U2. A pennant was made to commemorate each “hit”. This is the conning tower of the U2. There are other conning towers also. 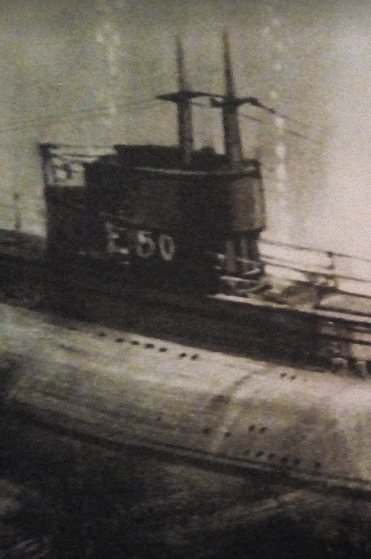 One os the E50, a British submarine which survived a crash, underwater, with a German submarine. The E50 survived only to hit a mine shortly afterwards. 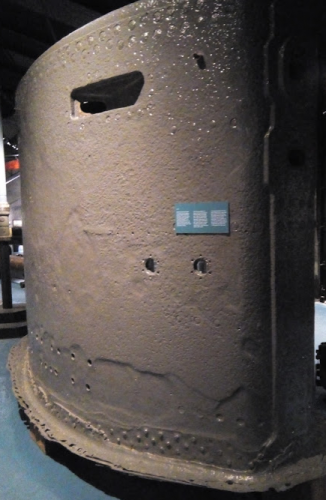 The conning tower of the E 50 weighs 11 tons! The awful panic when a ship begins to sink. The E 20 being lashed by the stormy seas, unable to budge. slowly breaking apart. 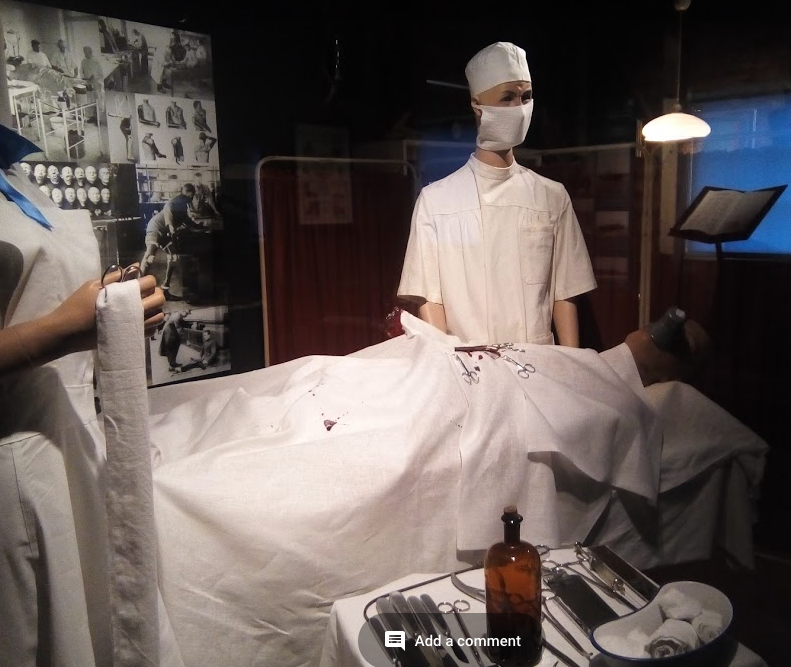 Rudimentary medical conditions on board a ship, Notice the little funnel clamped over the mouth of the patient,stuffed with a piece of cloth onto which would be put some form of ether, chloroform to keep the patient asleep. Some of the paintings of the battle scene. One of the 25 memorial stones to those ships and men lost in the battle. 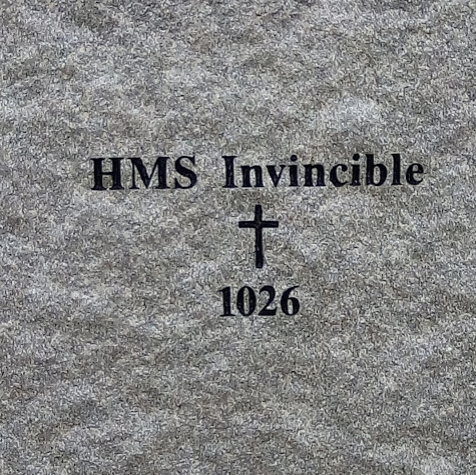 HMS Invincible went down with a loss of 1026 lives. 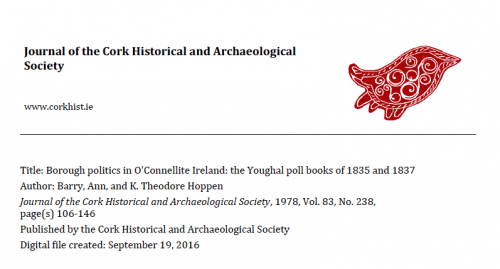 This entry was posted in Family History Searches on October 23, 2016 by Youghal Celebrates History. 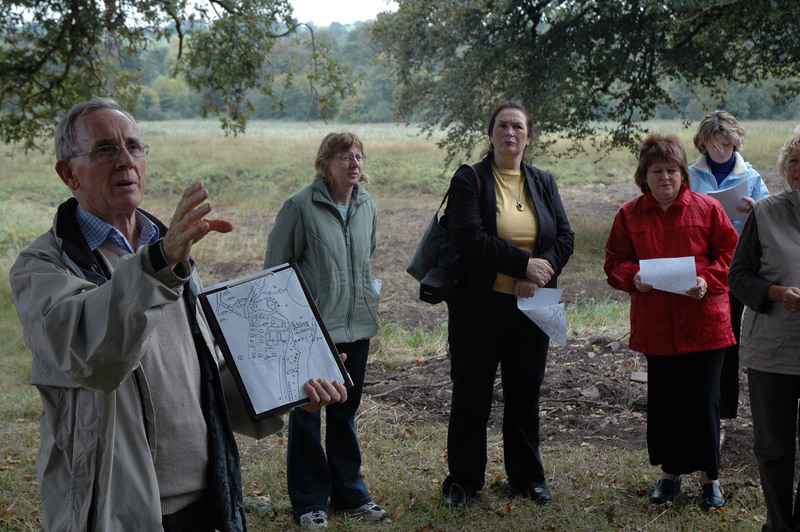 The article refers to the elections of 1835 and 1837 – a fascinating resource for anyone searching for roots before the Famine – it lists the voters, their occupation, their address. This entry was posted in Family History Searches on October 14, 2016 by Youghal Celebrates History. In Trinity College, Dublin there is a Guy’s Directory for Munster in 1893 . 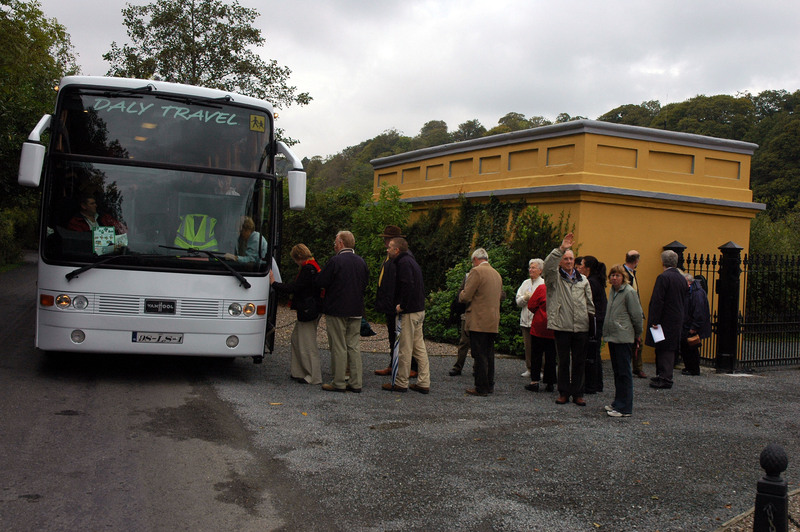 Guy’s Directories are available for many years in most county libraries – including Cork. The 1893 edition in Trinity can be bought or downloaded and lists all professions and addresses , town by town. This entry was posted in Family History Searches on October 8, 2016 by Youghal Celebrates History.